A friend asked me to fly the Cessna Citation CJ2 to the Super Bowl in Minneapolis while he was on a well deserved vacation. It sounded like a good idea, I always enjoy flying into busy airspace and events and it is a refreshing challenge coordinating all of the components and seeing so many aircraft in the air at the same time. It started out as a perfect flight, flying the CJ2 cross country from San Diego (KCRQ) to Minneapolis St. Paul (KSTP) for Super Bowl 52! Our support team, who manages the aircraft, did an amazing job arranging the ground details including coveted hotel rooms on short notice. We were able to get an arrival slot and parking — one of 235 reservations at Signature alone. and a total of 1200 aircraft operations in the area. After a stop in Van Nuys (KVNY) to pick up a passenger, and get our warm clothes ready for the cold we were off to Minnesota. we did a fast turn at Scottsbluff Nebraska (KBFF). 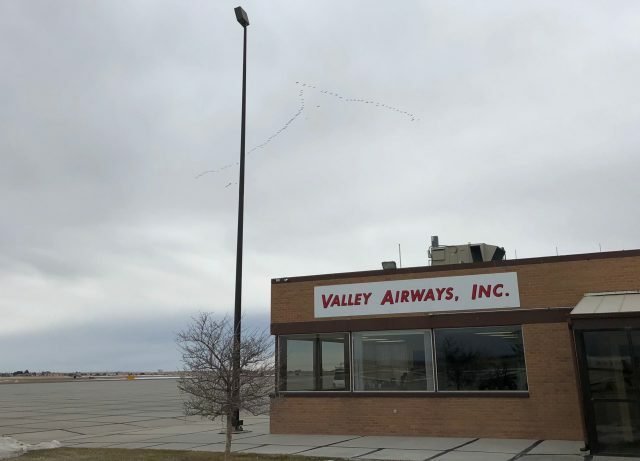 The fueler at Valley Airways, the FBO at KBFF, was great, providing us with a very quick turnaround and and very reasonable fuel price. Overhead we saw a flock of birds heading north, which seemed a bit early for February. We could have made it non-stop to KSTP if everything was perfect, including weather and traffic, however my experience flying into other high volume events, such as EAA , a stop is the safest option. I’ve been on final approach at Oshkosh (KOSH) and the aircraft in front of us had an incident on the runway, requiring us to go missed, enter holding, and eventually land elsewhere. The flight was great. 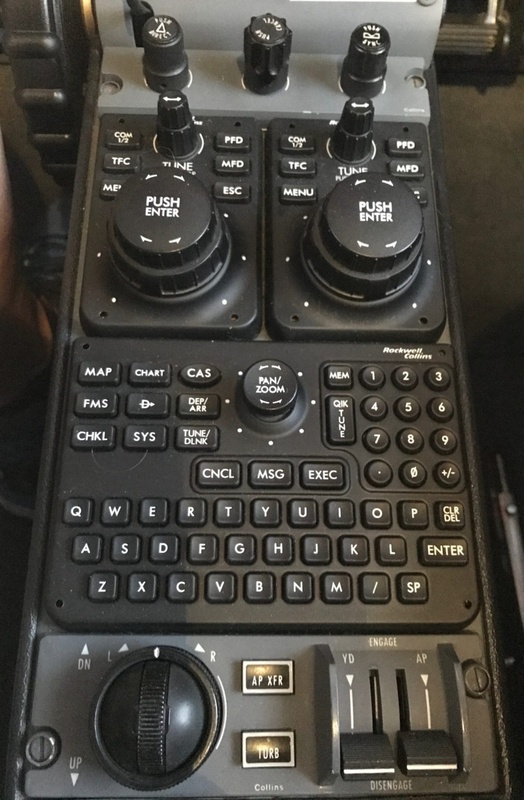 I took the opportunity to teach my co-pilot, Perry, some additional functions of our Universal Flight Management System (FMS) as we flew across the US at FL390. 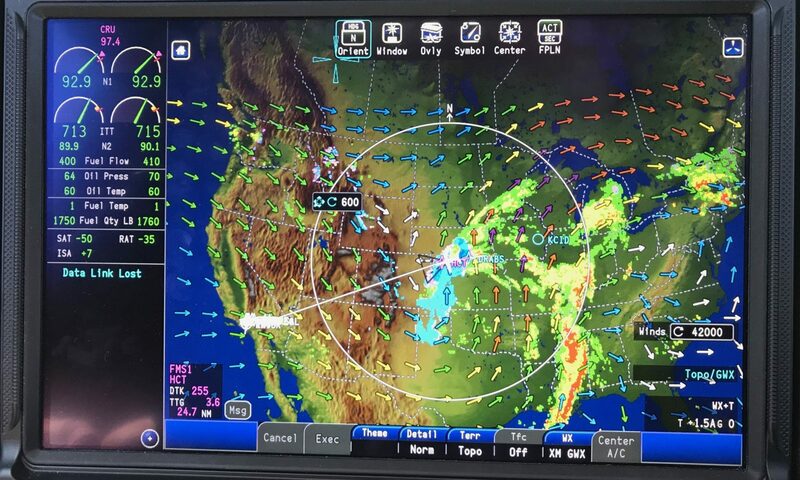 While not the latest system, it worked well especially when coupled with the Garmin GNS530 and our Rockwell Collins Pro Line displays. The outside temperatures were cold on this flight so it was easy to fly at that altitude in the CJ2 and it provided a slight speed advantage over flying at FL410 or above. We encountered some clouds, and a little ice on the descent however it was extremely smooth, and fun as usual! We were cleared into KSTP via the GOPHER 1 Arrival with the expected altitudes. Everything was going by our plan. Perry and I remarked how we fit in nicely into the flow into Minneapolis for the Super Bowl and while others had to hold, we were flying directly to the approach corridor. Other than anticipating weather that was 80 degrees colder than San Diego, we were set. Arriving into the Minneapolis area. Heavy traffic on the arrival. A lot of football fans! I arrived on base leg on the ILS 32 at exactly our arrival time slot, 1604 MST, which was probably a fluke, but useful in any case! This was the only runway open and was covered with snow and some ice, with a moderate crosswind, thankfully the freezing fog had left an hour ago. The other runways, along with all ramp areas, were snow covered, used for parking the large number of airplanes. It looked like one large snow field! Remember – Fly the Airplane! The ILS approach proceeded well, Perry was doing a great job monitoring our progress and did the callout at 500 feet AGL with a confirmation that the annunciator panel was clear, gear down, and runway 32 confirmed . 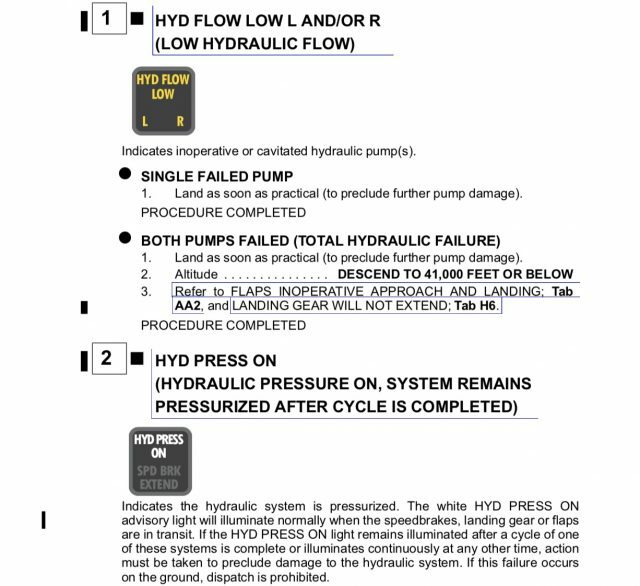 Out of the corner of my eye I saw the hydraulic advisory light flicker ‘HYD PRESS ON’ which is not usual when the system pressurizes as you activate the systems, such as flaps, speed brakes, or gear which are electrically controlled but hydraulic actuated. Upon landing we put out the speed brakes and the Hydraulic Low Flow Warning (HYD FLOW LOW L R ) lights flashed quickly, then went solid – on both engines. Not a good sign. When both of these annunciators illuminate it can only mean one thing – we lost all of our hydraulic fluid. We still had a ways to slow down the aircraft on a very slippery runway with a right crosswind and since the brakes are on a different system they would not be affected. The most important operation for a pilot is to always fly the airplane. If you allow yourself to become get distracted at critical times, it doesn’t always work out well. I elected to taxi off the runway and park the plane. At this point I didn’t want to block landing traffic, nor did I want to quickly shut down the engines without a proper cool down. The hydraulic pumps were probably already damaged however, if you shut down a jet engine too quickly you risk blade rub on the case and other issues. While shutting down the engines quickly with a hydraulic failure might save the pumps, however there are no guarantees they would be okay – especially when both lights were illuminated. 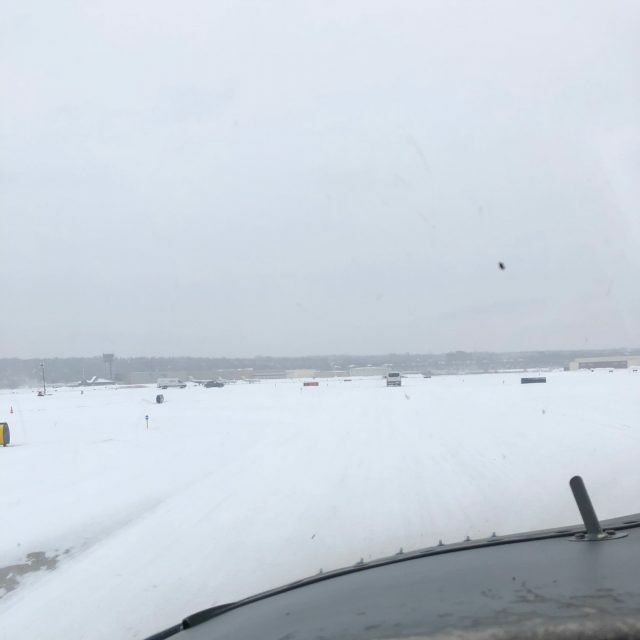 KSTP Ramp – Maybe I need a snow machine instead of an airplane. 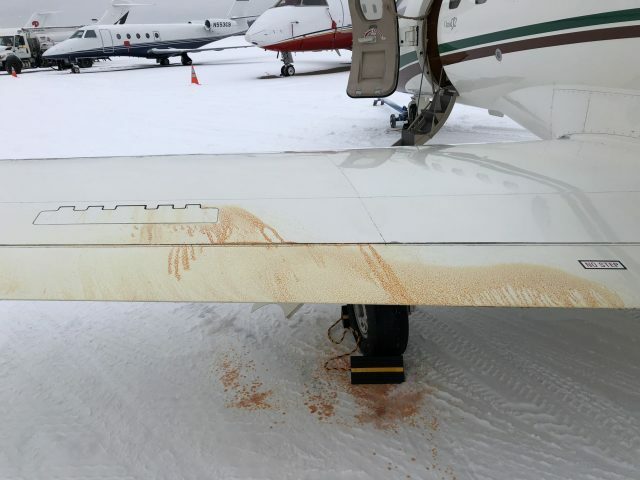 While I secured the plane Perry helped the passengers deplane in very cold weather and mentioned I may want to take a look at something that the line person noticed —- not yellow snow but orange!!! The left wing was partially covered in fluid by the speed brake, and unless I hit a Yeti on landing it was hydraulic fluid! We may have a slight problem with the left wing. Hydraulic fluid leaking from actuator. The left actuator had actually burst at the seams and virtually emptied the hydraulic reservoir onto the beautiful Minnesota snow – on Super Bowl eve at one of the busiest airports in the country that night. After ensuring our passengers were in the warm shuttle to the Signature FBO on the west site of the airport, we post flighted the aircraft and started working on a plan. We had made it to the Super Bowl and we could deal with it, we just didn’t know how at that time. Remind me – Why did we leave San Diego? 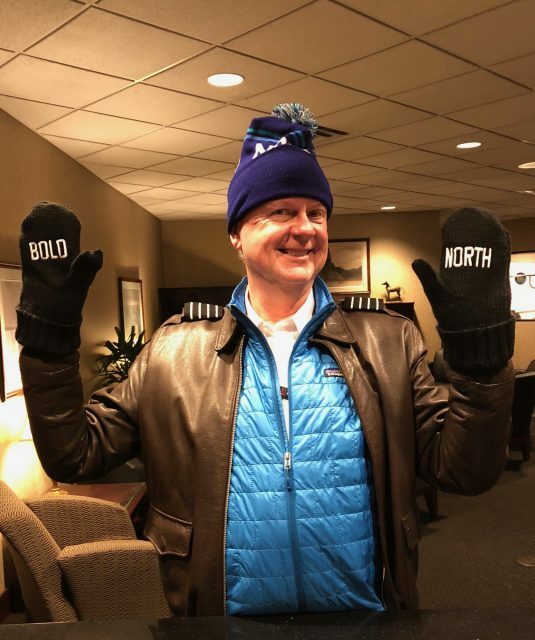 Upon entering Signature shivering a bit from the cold, the Super Bowl Host Committee greeted us with mittens and hats, a great indicator of hospitality, and warmth. Over the next few days we would visit them often. I inquired if Signature had a maintenance facility, which they did – TechnicAir. Things were looking up. I was put in touch with Bill Wuorinen , the maintenance supervisor at TechnicAir and explained our situation. I knew I was asking the impossible – significant maintenance help on the Saturday night before Super Bowl, below zero temperatures at night, with no hangars available and a number of other pilots needing help. Within 15 minutes we had a plan – Bill graciously agreed to help me diagnose the problem and move one of their planes out of the hangar. Bill and I moved the plane to their shop. It was now almost 7pm and one of Bill’s staff started work on it immediately and removed the burst actuator from the left wing. The fluid pressure in the system is approximately 1500PSI and it appeared the bolt heads had sheared which meant that fluid at extremely high pressure exited the system immediately upon activation of the speed brakes. The Textron Mobile Service Unit (MSU) was unable to help for at least three days, so it was gracious of Bill to help. The actuator was ordered just before 10 pm for delivery the next day and we hadn’t confirmed the status of the pumps; that would need to wait until the morning. In retrospect it probably would have been a good idea to order new pumps at that time as well. I elected to explore Minneapolis to see the excitement for Super Bowl. It was crazy downtown. After walking around, seeing if I could still avoid frostbite, I found a great small place off the beaten path with a DJ, Lyon’s Pub. I appeared to be the only non-local which meant it was a great local bar. I could tell I was in Minnesota since people were wearing knit hats and boots on the dance floor ! 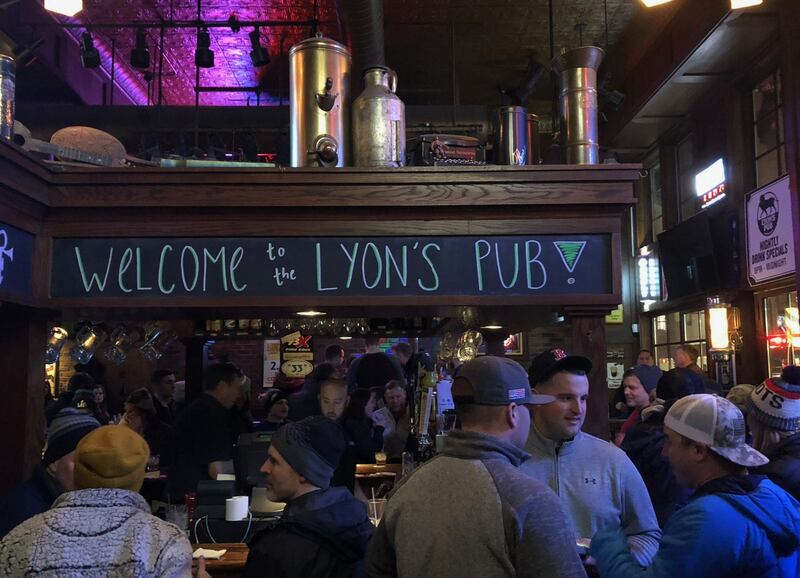 If you visit Minneapolis I highly recommend a visit to Lyons Pub, for drinks o music. Everyone was excited about the game and it was fun talking to folks about their predictions. 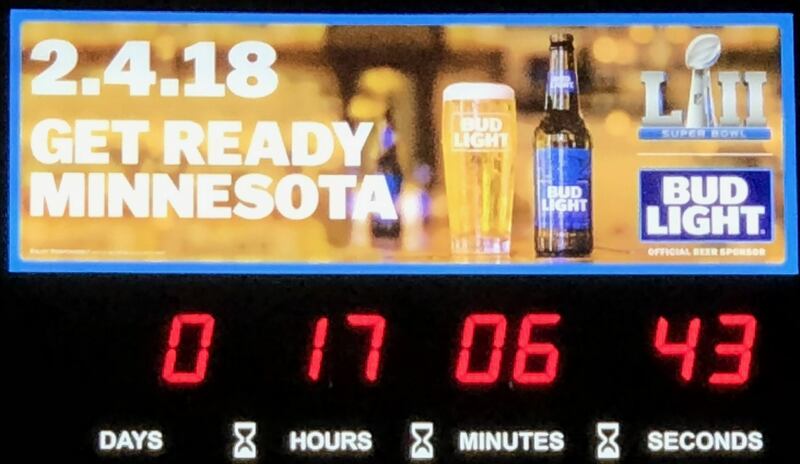 The Super Bowl Clock countdown – only 17 hours to go! Bill kept me advised late into the night on the part delivery tracking and we both hoped our problem would be solved quickly. Little did we know that in the morning we would find the hydraulic pumps were also damaged. In the morning they removed the hydraulic filters and found what appears to debris from the hydraulic pump. New pumps and filters were required, and ordered. Another delay, and now we were trying to get the parts delivered same day during Super Bowl. I have to give credit to the Textron delivery process, they had the pumps on a flight to MSP to arrive on a United flight at 11:30pm. The problem now was United airlines wouldn’t release the part to us until the next morning, not exactly the best customer service for AOG. Early the next morning the technicians noticed that one of the replacement pumps arrived damaged from Textron. Our significant delay was expanding even more. I had two passengers that had critical meetings on Monday and a broken bird. As Captain I take responsibility for both my passengers and aircraft, so now it was off to find alternative transportation. There were no commercial flights within four hours of driving distance due to the Super Bowl, so we worked on a charter option. The problem was there were no arrival slots, even if we could find a plane to charter. While a colleague searched for charter options, I negotiated for arrival, and the subsequent departure, slots. The staffs at Signature at KSTP and Lynx at KANE were incredibly helpful in arranging the slots we needed. After additional work by TechnicAir the plane was back in service on Tuesday. In light of the situation the down time was relatively little, however it was accomplished by a great team effort of all the aviation professionals in Minnesota and Textron. The Cessna Citation CJ2 utilizes two separate hydraulic systems, one for the brakes, and another one that operates the speed brakes, flaps, and gear. The brake hydraulic system is ‘closed-center’, while the later system is ‘open-center’. An ‘open center’ does not operate at high pressure until a sub system is activated, the fluid simply circulates. 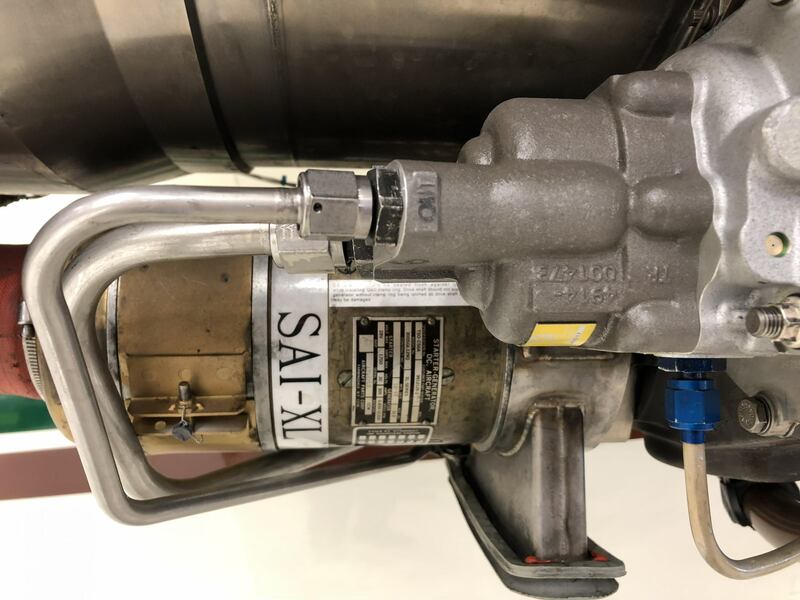 When the pilot selects an associated flight control device such as the speed brakes or flaps, pressure valves close which builds system pressure to 1500PSI. Then high pressure hydraulic fluid is routed through the appropriate actuator to operate the sub-system. In our case, when I extended the speed brakes, a valve closed routing 1500 PSI hydraulic fluid to the actuators. The left actuator then burst, sending high pressure fluid out of the system. The reservoir holds 156 cubic inches (2.7QTs) of fluid, so fluid would quickly exit the system. The hydraulic pumps are mounted on the engine accessory gearbox where a number of ancillary equipment are located including the oil pump, Fuel Distribution Unit (FDU) and the PMA alternator. Of course when the hydraulic fails you lose your speed brakes, flaps, and normal gear extension. When the system is breached, such as our actuator bursting, the fluid can quickly exit the system. Once the hydraulic pumps run dry the impeller is no longer lubricated by the fluid which starts the processes of destruction. Once the friction reaches a critical point the pumps fail and in theory the pump drives shears in order to minimize any damage to the accessory case. Im our situation, the pumps were still operating and the drive shaft was intact. 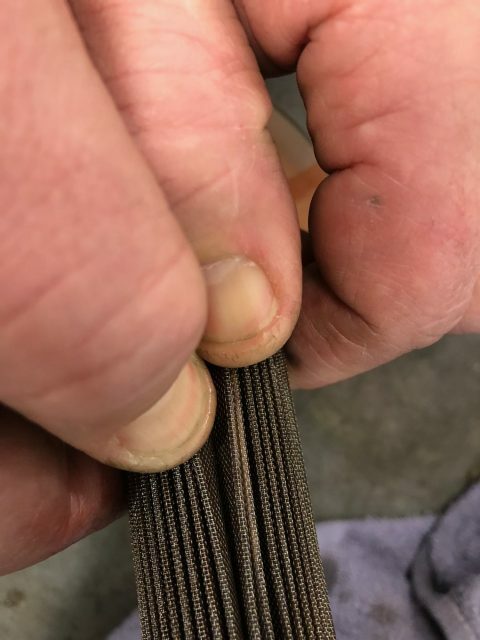 If the pump fails completely then it also sheds material inside the housing necessitating replacement of carbon seals within the gearbox. 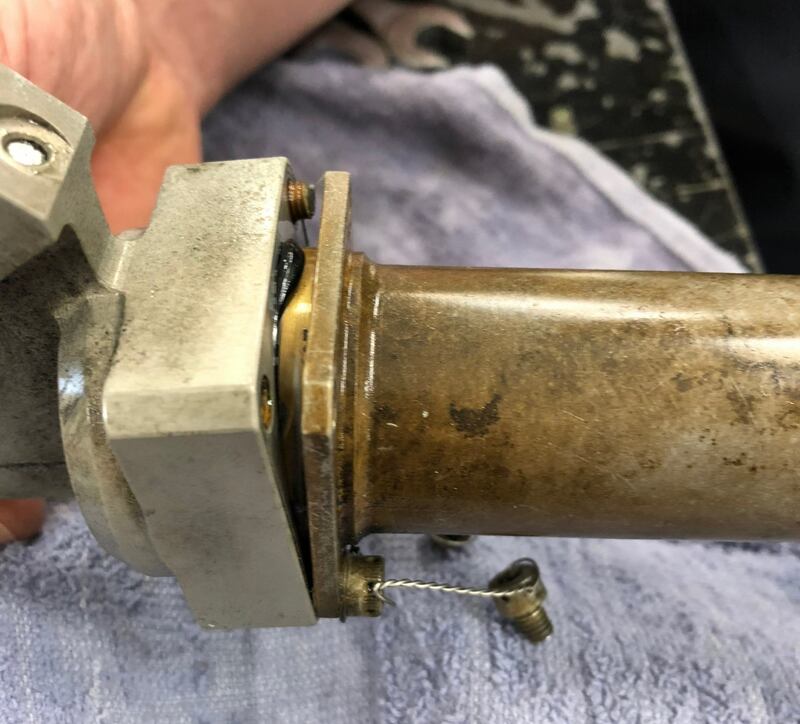 If you lose one hydraulic pump, the hydraulic systems may continue to operate unless there is a loss of fluid as in our case. If you lose both, then you are in a different situation. If a pilot has complete hydraulic failure of this system, then you are faced with no flaps, no speed brakes, and emergency extension (but not retraction) of the landing gear. This translates into longer runway requirements and slightly more complicated speed control. If the runway is contaminated (wet, snow, ice, etc.) then it further complicates landings due to additional runway required for landing. I’ve reviewed the incident many times, as the pilot and as a Flight Instructor, analyzing the best procedures. The established aircraft checklist can only provide guidance under a certain set of circumstances, and are not designed to provide steps for all scenarios. The checklist only has one option – Land as soon as practical’ – well I had done that so in theory I was successful. My main focus was to ‘fly the airplane’ and ensure the safety of my passengers as the primary goal, with the secondary goal to minimize damage to the airplane systems. If I had shut down the engines immediately upon low hydraulic pressure I may saved the hydraulic pumps however we would have faced additional issues including loss of braking, potential engine damage, etc. 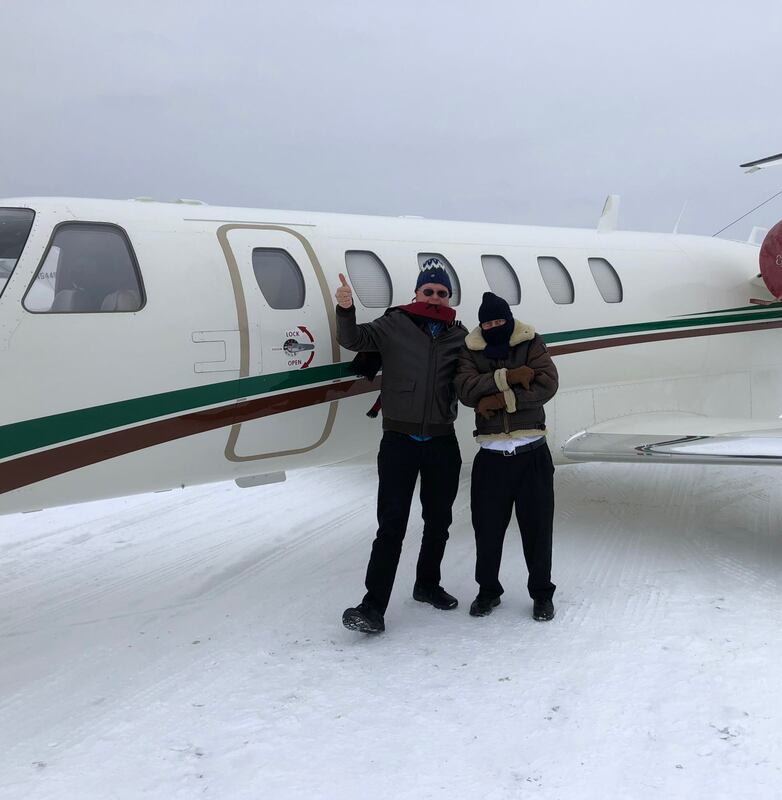 Despite the issues with this incident, I was pleased my passengers had a great time visiting a wonderful city and viewing one of the best Super Bowls – Go Eagles! 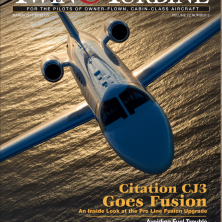 copyright 2017,2018 Personal Wings, Inc.
April 2018 – Read my Twin & Turbine article in the March 2018 issue on flying Fusion in the CJ3! The plane on the cover, and in the article, is the primary one I fly! 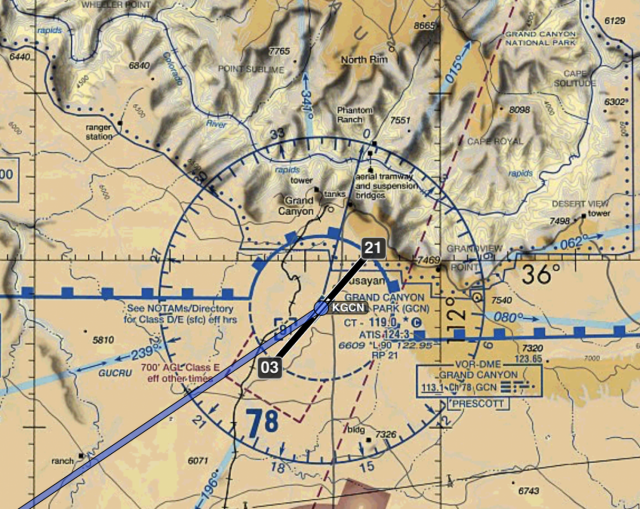 August 7, 2017 – new content and videos on flight planning, navigation, and weather. Note: Due to the size of the photos, their resolution in the blog is scaled down. To view higher resolution images, most photos link to higher res with a click. This is a very long blog! I tried to keep it short, however Pro Line Fusion is a very capable avionics suite and even at this length, I only barely touch the surface! 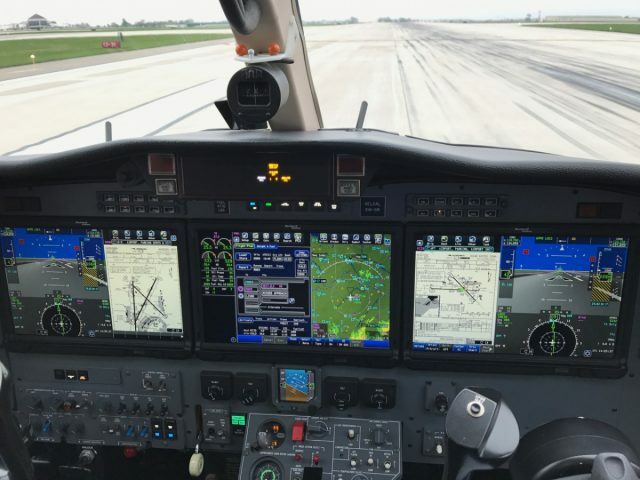 I had been looking forward to flying the CJ3 with Rockwell Collins’ new Pro Line Fusion avionics systems since the upgrade program was conceptualized 2 years ago. The CJ3 jets were originally outfitted with the Pro Line 21 avionics suite which is a extremely capable system, but as with all technology, didn’t match the full capabilities of newer aircraft avionics. 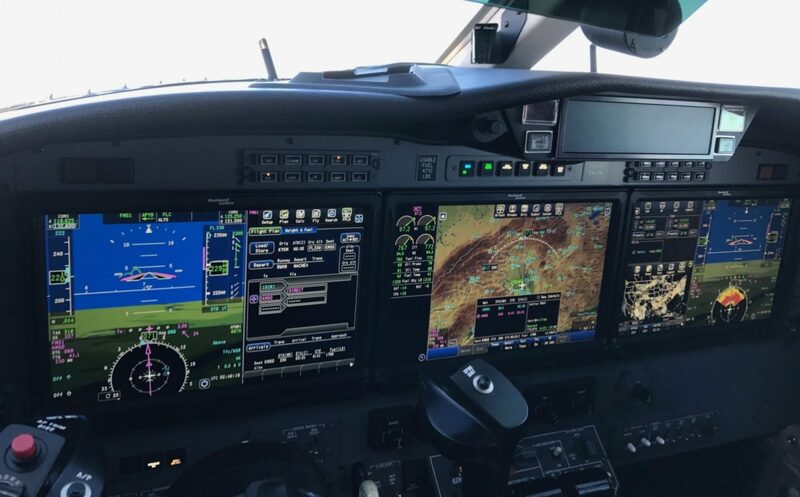 Cessna has been delivering the CJ3+ with Garmin 3000 avionics since 2015 which offers the latest Garmin technology, but until Fusion was announced there were no advanced system upgrades for the CJ3, other than WAAS and other enhancements to the Pro Line 21. 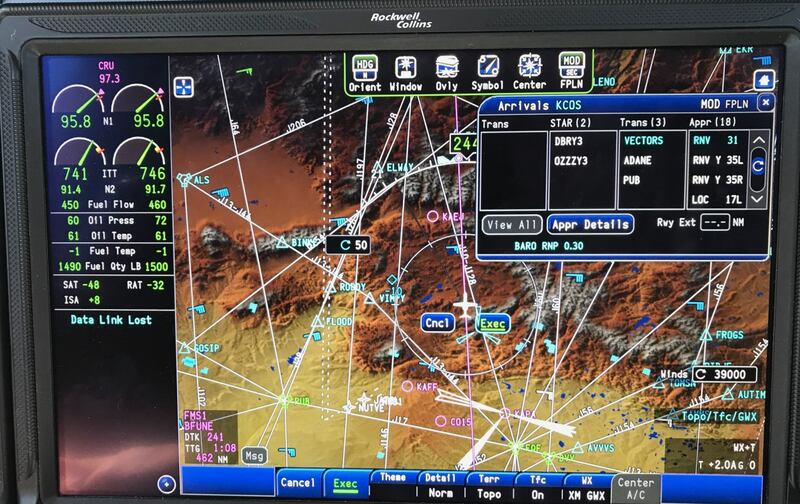 The Garmin 3000 is a great system, offering touch controllers, high resolution displays, and other enhancements over previous Garmin systems such as the G1000, which in itself was a transformative change when released. Rockwell has been using the Fusion system in other platforms for a short time, and recently had installed them in the venerable Beechcraft King Air, which now offers them as a factory installed system. It was this system that Rockwell elected to customize for the Citation CJ3. The Pro Line Fusion is unique in many ways, including the incorporation of touch screen technology in the PFD (Primary Flight Display) – a first for the aviation industry. While others have utilized touch controllers (G3000) or touch sensitive navigation displays (Garmin GTN series) this was a bold move by Rockwell to explore this technology. 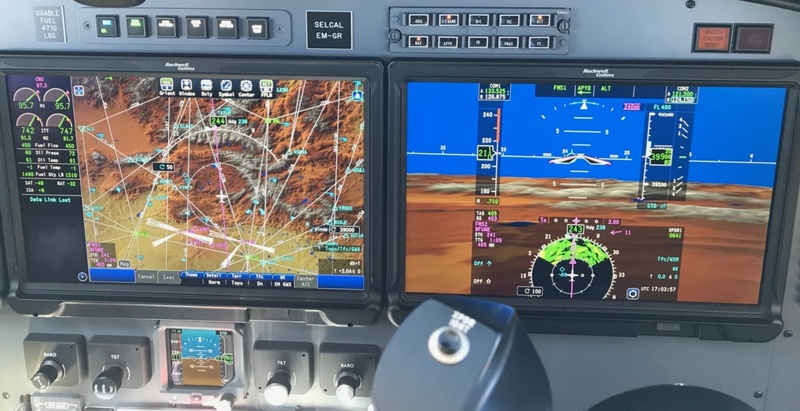 The upgrade program engineering is extensive, and took over a year for Rockwell Collins and Duncan Aviation to design, install, fine-tune, fly, and obtain FAA approval for this system. A CJ3 owner graciously gave up use of his airplane for a year, so it could be used as a test bed. On Friday April 21, 2017, the FAA granted the approval STC to Rockwell Collins for the CJ3. It was only a few months later than anticipated, however it was worth the wait. On April 26, Dave Lenz picked up his airplane at Cedar Rapids and made a few flights with Dale McPherson one of the Rockwell test pilots. After they landed it was now up to Dave and I to explore the aircraft. It was great to have the opportunity to teach, and fly, the first CJ3 with Fusion. Our first flight was short – Cedar Rapids IA (CID) to Madison WI (MSN). It was helpful to have read the 838 pages of the Fusion Operating and Installation Manuals prior to the flight, but trying to remember everything was a challenge and clearly wasn’t possible. Rockwell Collins has a few YouTube videos explaining some of the basic functions which are helpful. While it is clearly a different technology architecture, previous experience with Pro Line 21 provided the basis for many of the FMS (Flight Management System) features, outside of that is is vastly different. After 40 hours with the Rockwell Pro Line Fusion installation, I’m still learning about all of its capabilities. My intent with this review to offer you a glimpse into this powerful suite, not to cover every aspect of its operation. My goal is to constantly update this blog as I teach, and fly the CJ3 over the next several months. 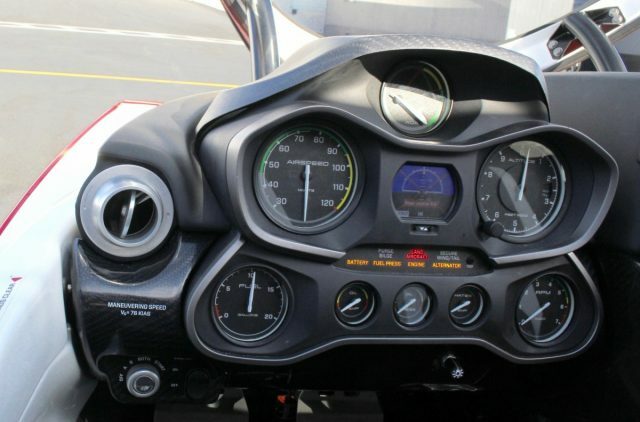 The Fusion system is comprised of 3 Adaptive Flight Displays (AFD). Rockwell Collins also names them Display Units (DU), in case you get confused like I do sometimes. Each AFD (DU) can serve as an MFD (Multi-Function Display) or a Primary Flight Display (PFD), depending upon configuration. This also is useful when an individual display is not functioning, the other displays can show the information from the inoperative display. All of the data is entered on the AFDs, either by utilizing touch on the displays themselves, or through actions using the Cursor Control Panels (CCP) and Multi-Function Keyboard Panel (MKP). These multiple methods of entry are one of the most powerful features of Fusion. The CCPs (one for each pilot) and the MKP (which pilots share) are located on the center pedestal. This is the same location that previously housed the FMS display and Keyboard for the Pro Line 21. 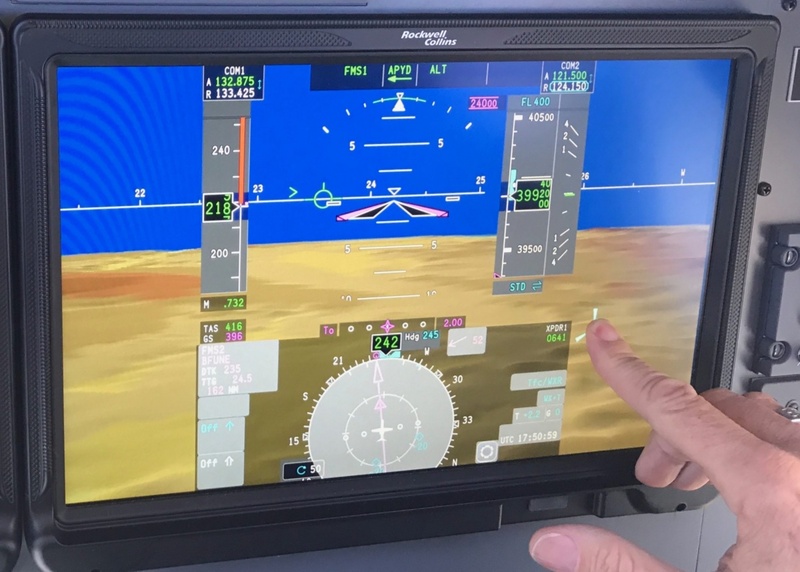 The location of these controls is a natural reach for both pilots and enables the pilots to use either these controls, the touch screens directly, or both in conjunction for screen navigation and entry. The most optimal method for me is to first touch the AFD field I want, then use the CCP and MKP to do my data entry. As you can see in the photos, the autopilot CRS, ALT, and HDG controls have moved to the top of the pedestal, still in easy reach. The CCPs have several functions that can mimic, or enhance, touch functions on the AFDs. The controller (RC terms this a Multifunction Knob) serves as a joystick for movement on the AFDs, selection of fields for data entry, and select list data – hence the name. The Multifunction Keyboard Panel (MKP) is extremely powerful. In addition to the keyboard – which is now in QWERTY format, the MKP contains a number of quick access function keys, and joystick. Pro Line 21 pilots will see familiar keys such as CHART, however many are new. 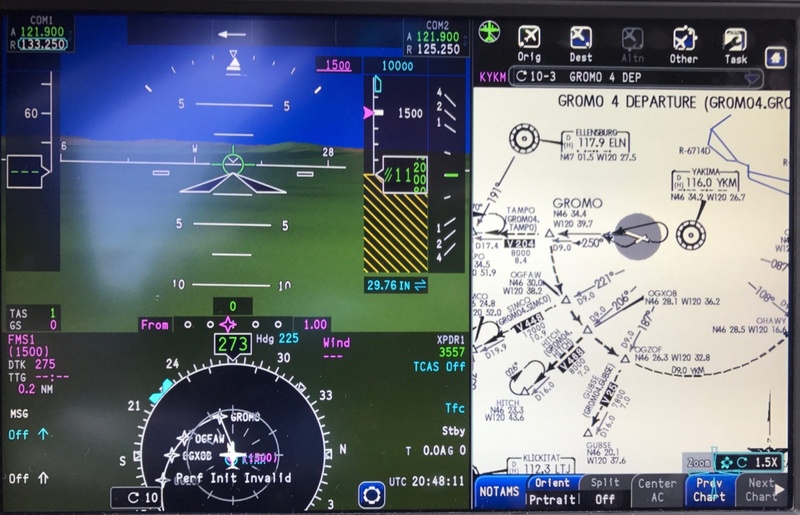 Unique to aviation is the incorporation of certified touch-enabled PFDs that are a key component of the Pro Line Fusion. 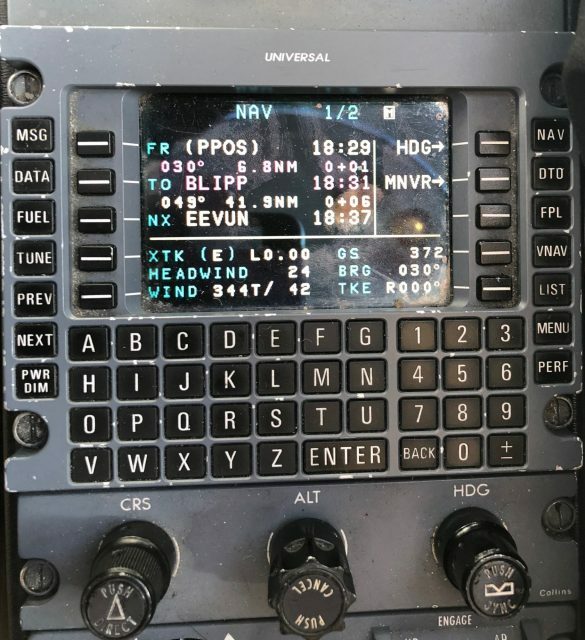 While some avionics manufacturers may also offer touch screen MFDs, the Fusion system offers some unique capabilities. Since only portions of the PFD are enabled for touch, you may forget which ones. It is simple to find out, just touch the screen on the side and the ‘hot spots’ appear on the PFD to show you the active regions. Now that I’ve given you a brief introduction to the architecture, it is time to pre-flight the system and fly! One of the first steps is to check the status of the system (Databases, GNSS, Position, etc), initialize our weight and fuel, calculate performance parameters, and load a flight plan. The Pro Line series excels at flight plan data entry, and the Pro Line Fusion is no exception. As mentioned, you can load flight plans using either Plan or Fly pages – however only Plan will support Airway inclusion directly. Once the Airways are loaded, you can see the full waypoint detail in Fly, and of course modify as needed. 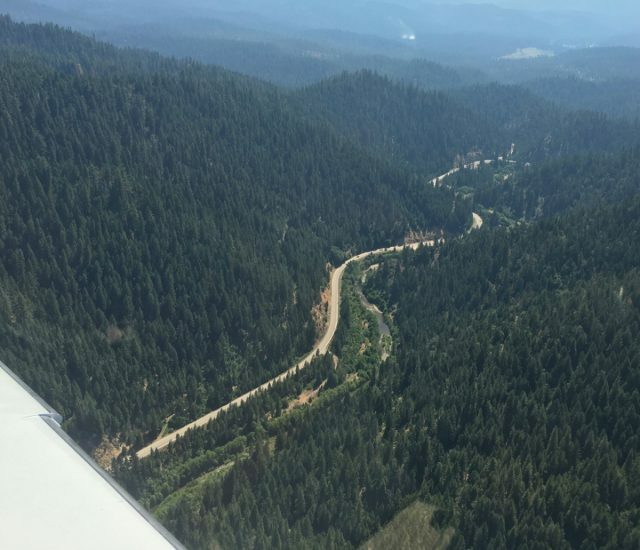 Departure and arrival procedures, including approaches, are loaded into the flight plan using the Dep/Arr button The photo below show a curved departure, GROMO 4, on a recent flight from Yakima Washington (KYKM). While initially the departure looks somewhat complex, the Fusion system makes it simple. Since it is an RNAV departure, the Flight Director and Auto Pilot greatly facilities flying it, and it was fun flying the arc. Pro Line Fusion provides what seems an almost unlimited number of display options, offering the pilot a wide variety of flight plan management capability and situational awareness configurations. One advantage of a long cross county with Pro Line Fusion, is you get a chance to explore all of the display options and features! Sometimes it is even more important to just look outside and appreciate the unique opportunity to pilot such aircraft at 45,000 feet. Entering Crossing Restrictions (e.g. 10 miles east of JLI at 10000) is easy with Pro Line 21 and Fusion offers even additional methods. Here are some of techniques to enter the data. Graphically on the Map. You can touch the waypoint on your map, and the Waypoint menu appears – Select Crossing and the Crossing options shown below. Waypoint Icon – Plan or Fly Page. Touch the Waypoint ICON (Note- it is easy to forget and touch the Waypoint name) for the Waypoint menu, Select Crossing and the Crossing options appear in another pop-up dialog/menu. Waypoint Field. – Flight Plan or Fly Page. 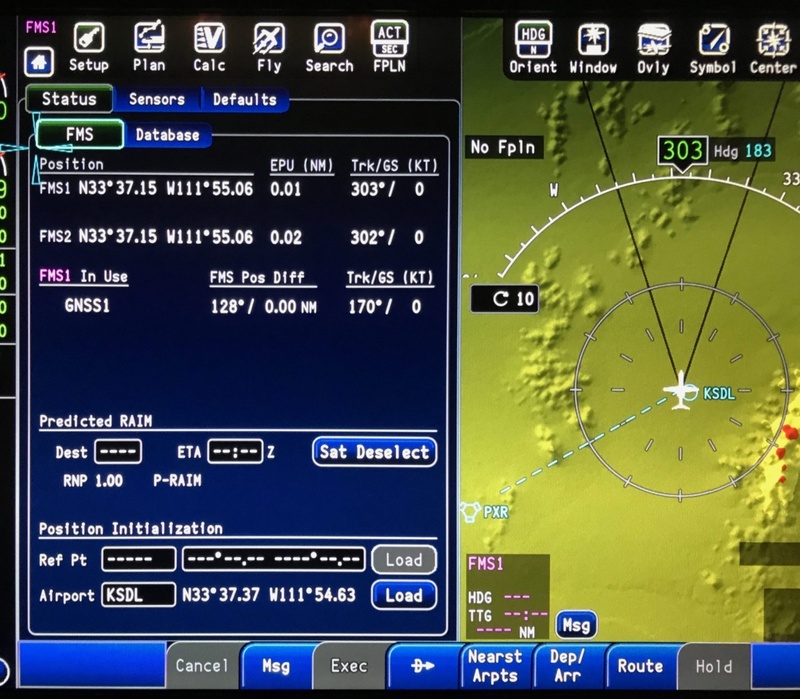 This is the easiest – just to the right of the Waypoint is a field – touch it and you can directly access the Crossing menu. Crossing Restriction before a way point – Second step is to select condition (e.g. AT), altitude (5000), IAS (if applicable). One easy method is simply to touch the empty field to the right of the new waypoint KMSO001 and the Crossing Dialog appears. As with so many other features of Pro Line Fusion, there are a large number of methods to select an approach or arrival at an airport. As shown above for the departure, you can select the Dep/Arr button on the Plan or Fly pages. Perhaps a very unique method is to access arrivals by selecting the ‘feathers’ on the runway approaches depicted on the MFD at the airport icon. As you can see by the MFD photo below, there are ‘feathers’ that depict instrument approaches to runways. Rockwell Collins has displayed the feathers using the orientation of the runways – a great way to spatial orient a pilot to the airport. While we have always been taught to visualize the runways at an airport, this method is far superior to guide the pilot. With Fusion, you can simply touch one of the arrows and the available approaches appear on a pop-up dialog box. I found it very useful when evaluating alternative airports along the route, or when I simply wanted to pick an approach at an airport. MFD showing the ‘feathers’ that represent airport approaches. 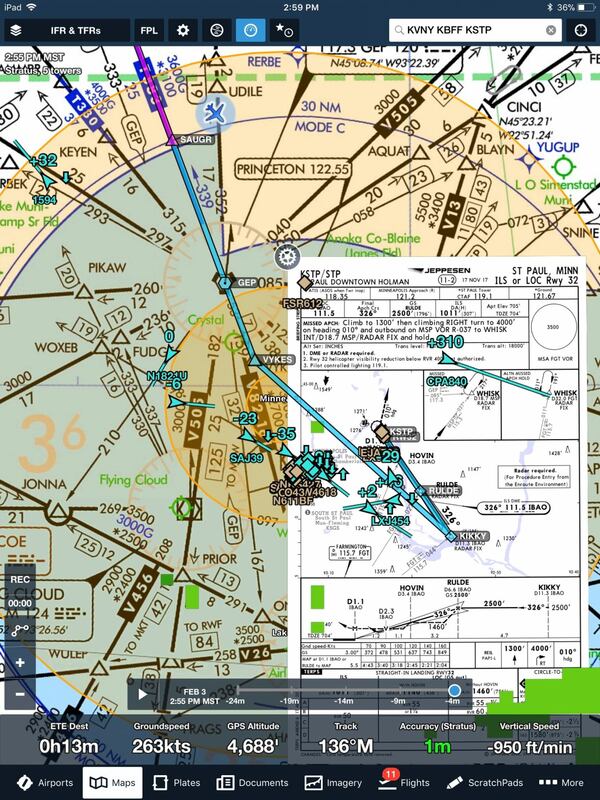 Selecting Arrivals by touching the airport on the MFD – KCOS. One of the coolest features of Pro Line Fusion is the outstanding number of weather display options. In addition to onboard Radar, XM/Sirius Weather, you can also add the optional Datalink Request system for weather. I’m only describing the tip of the iceberg, if you can forgive the weather pun! 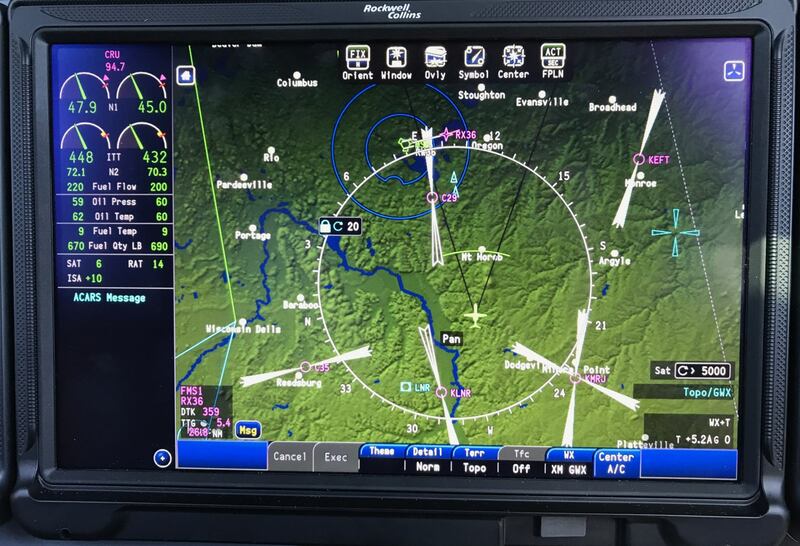 Fusion provides an amazing number of display options, and you can only begin to explore them all over several cross country flights. The pilot can display weather on any one of the AFDs, either as an overlay on the MAP, or a dedicated Weather window to display graphical or text weather. While the Pro Line 21 suite offered a robust list of weather options for display on the MFD, usually be accessing the menu through one of the MEM keys, the Fusion pilot must configure their display. As noted earlier, this would be a great use of one of the Display Memory keys – perhaps User A or User B.
I don’t know if there is a conclusion! After spending a lot of time with Pro Line Fusion, taking 1400 photographs of the system, and a large number of hours writing, I could still spend more time exploring its capabilities. 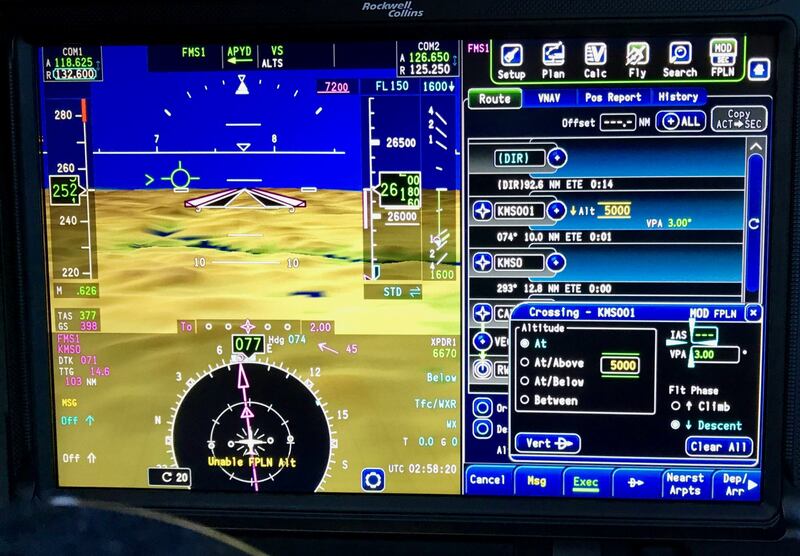 A pilot familiar with Pro Line 21 can learn the system in a few days and operate the system proficiently, however they will only discover its full power over time, similar to some of the more advanced avionics now available to pilots. Pro Line Fusion is definitely an significant jump in capability over Pro Line 21. I still enjoy flying the later system, however the Fusion system is definitely worth evaluating this upgrade path. For those CJ3 Pro Line 21 operators anticipating adding WAAS and ADS-B out to their existing aircraft, upgrading to Fusion at an approximate cost of $325,000 which includes those functions is worth evaluating. I worked on the software for the first HUD for Flight Dynamics, later to be purchased by Rockwell Collins. I would love to see that system integrated into Fusion. While I enjoy using Fusion, there are still some issues that Rockwell Collins will need to resolve, such as Vspeeds, Performance, ADS-B in, and some usability changes. Of course, I’m very particular and I can always find ways to improve aircraft systems! ICON A5 Review – Grab your water shoes, beach towel and swimsuit! On an earlier blog I wrote about obtaining my Commercial Seaplane Rating in Alaska, you may have read how much fun it is to fly a floatplane (seaplane rating per the FAA). I had a blast flying the Pacer and Super Cub on floats – splashing around on lakes in Alaska. Recently, again in Alaska, I had the opportunity to experience a ride in a 1942 Grumman Goose amphibian (only 17 left in the world) and Lake Renegade amphibian, as well as fly a Cessna 180 on floats. 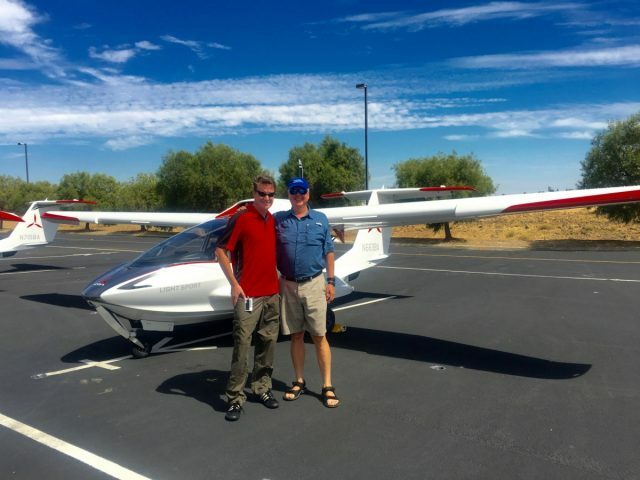 ICON Aircraft offered me the opportunity to be one of the first pilots to participate in their new training program and fly their amazing Light Sport Seaplane amphibian – the ICON A5. I have a deposit on a future A5, however my particular aircraft probably won’t be available for a few years. The ICON A5 is in a relatively new class of Light Sport aircraft, which opens an incredibly wide range of opportunities for pilots; Sport Pilots and Private/Commercial Pilots alike. Officially it is a Light Sport Aircraft-Single Engine Sea (LSA-ASES). While there have been other great LSA-ASES on the market, this one has probably garnered the most interest recently. I won’t go into the full details of the FAA Sport Pilot license (SPL) in this blog (more details at AOPA or EAA), however basically it allows a faster method to obtain a pilot’s license. In as little at 20 hours (most people require more time) you can obtain a Sport Pilot License to fly an airplane, lighter-than-air (balloon), weight-shift, or gyroplane depending upon your training. Training for a floatplane rating, will take some additional flight and instruction time. With a Sport Pilot license there are some limitations in comparison to Private Pilot license (PPL). You are limited in the size of the aircraft you can fly, where you can fly, when you can fly (no night and high altitude flying), and can only take one passenger. Even with these limitations, it is a great avenue to obtain a pilot’s license and have a lot of fun, and you can always progress to the less-limited Private Pilot’s License later! One of the nice aspects of a Light Sport aircraft, is you can also use it for training for a Private Pilot’s license, usually at a lower cost. If you already have a Private Pilot’s license, you can fly any Light Sport Aircraft that matches your category and class (e.g. single engine airplane land). In order to add a Sport Pilot additional aircraft category and class (e.g. single engine seaplane) to your PPL you follow the Sport Pilot additional rating process. Upon completion of the SP training you take a Proficiency Check – rather than a Practical Test. The Proficiency Check is very similar to the Practical Test except it is administered by a CFI. You can also use a Light Sport aircraft, like the A5, to add a full rating to your Private or Commercial Pilot’s license which would then require a check ride with a Designated Pilot Examiner (DPE), similar to the SPL Proficiency Check. It may seem a bit confusing at first, especially since you have so many options, however the process is fairly easy. The ICON A5’s primary structure is carbon-fiber for strength and light weight. Weighing in at a max gross weight of 1510 lbs., it has a maximum useful load of 500 lbs and fuel capacity of 20 gallons (100LL or Unleaded 91 Octane automobile fuel). Powered by a very smooth Rotax 912iSc, fuel injected engine, running a propeller at a maximum 5800 RPM (4800-5000 RPM in cruise), producing 100 HP. With a fully digital Engine Control Unit (ECU), it provides a modern way to power an aircraft, with automatic ignition and fuel/air management. This is definitely the way to power piston aircraft. All light sport aircraft have a gross weight restriction; in the case of LSA-SES it is 1430. ICON was able to convince the FAA to allow them a higher gross weight due to some great aircraft design features, including a parachute system, the Complete Aircraft Parachute (CAP) provided by BRS – similar to the one in my Cirrus SR22. The ICON A5 CAP is very unique, when you deploy the parachute an interconnect also lowers the landing gear to further soften your emergency landing. Wingspan 34.8 ft – folded 7.8 ft. 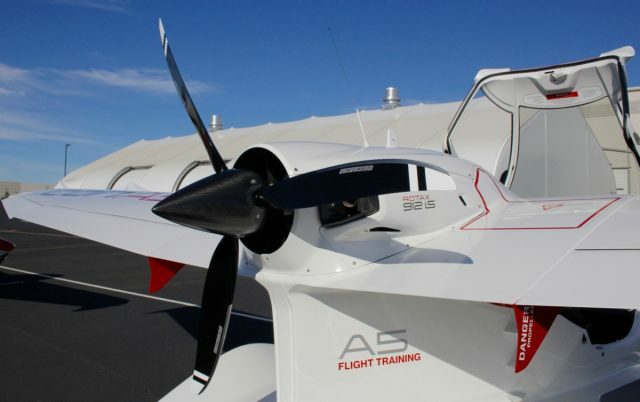 The A5 uses the Rotax 912iS engine, coupled with a Sensenich 3-blade composite propeller. Since it is a pusher configuration, it avoids some of the damaging water spray while on the water and offers the pilot and passenger an unobstructed view. While the engine is mounted high on the fuselage, the pre-flight checks are easy (more on that later). Cooling is also optimized – as long as you don’t leave the canopy fully open after engine start ,which may impede the air flow. Checking oil is also very simple, just step on the seawing and check the quantity on top of the engine. Since it is both air and water cooled, you check the coolant level at the rear of the engine during preflight. This is an electric airplane, utilizing a 12-volt battery charged by 2 alternators. The Engine Control Unit (ECU) utilizes two channels (Rotax calls them ‘lanes’). The primary alternator for the ECU is actually the smaller 16-amp unit. The 30-amp alternator powers the avionics, battery, and provides backup power to the ECU. Since the ignition system is fully electronic, similar to a car, the two alternators are needed for redundancy. The plane makes extensive use of LEDs for lighting, as expected, providing a good internal lighting environment and excellent position and taxi/landing lights. A5 LED Position Light – Needed as a plane and a boat! The A5 uses a single, fuselage-mounted, fuel tank, with an amazingly accurate self-calibrating fuel indicating system. You only have to put the fuel selector in the ‘ON’ position in flight. The airplane incorporates 2 engine-driven fuel pumps, again for redundancy. The engine utilizes premium autogas (MOGAS) or 100 LL – the advantage of longer oil change intervals, etc. with the autogas. Another clever ICON design is solving the issue of checking for fuel contamination. 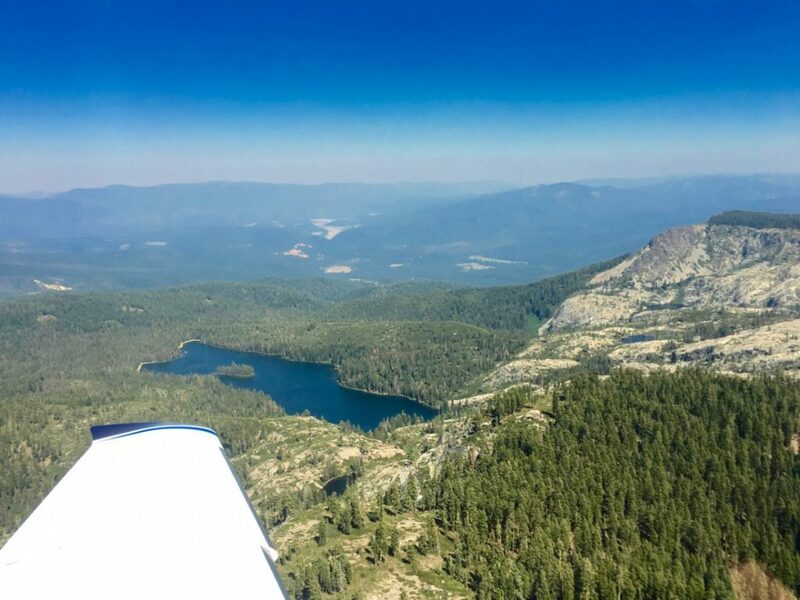 Sampling fuel on a land plane can be a nuisance, on a float plane it is a major pain, trying to balance yourself on a float – hanging out over the water to reach a wing sump or balancing between the floats in the front for the engine sump. ICON’s design is downright simple. They incorporated a tube inside the fuel neck that reaches to the bottom of the fuel tank. The pilot inserts a syringe that connects with that tube and you draw a fuel sample up for examination – nothing could be easier! In land retractable aircraft you utilize a squat switch to prevent gear retraction on the ground, not in an amphibian! Since you can extend and retract the gear in the water, without a weight-on-wheels sensor to prevent accidental retraction, you need to be careful at all times. A simple task if you use the checklist – every time. As a Computer Science Professor and techie, I love technology in airplanes. There are a number of great LSAs and other aircraft with powerful glass panels featuring integrated MFD (Multi-Function Display) with EIS (Engine Indicating Systems) and PFD (Primary Flight Display) implementations. I enjoy flying and teaching in them, however the ICON A5’s design offers a very efficient implementation for its mission. At 6′ 3″ I found the 46″ wide cockpit quite comfortable, even after 2 hour flights. The cabin height is great, however our son is 6’7″ and for him it is a bit tighter especially the legroom. The ICON staff mentioned that they aimed for the 95 percentile in fit, which makes sense, however 97% would be even better for our son 🙂 On the other hand it fits me perfectly! After flying over 80 aircraft makes/models, from taildraggers and gliders to helicopters and modern jets, it is wonderful to slip into the cockpit of the A5 and experience a well designed and ergonomic cockpit. The ICON folks designed a cockpit environment that is intuitive the minute you sit in the pilot’s seat. With the instrumentation conveniently arrayed in front of you with easy to read analog displays, it just seems right! The Angle of Attack (AOA) indicator sits prominently at the top. ICON positioned the AOA at the top for a reason – you reference it during all phases of flight and it is an important instrument for landings. The A5 utilizes a Garmin 796 GPS, which is removable, as the navigation system with XM capability and communicates with the single Trig COM. 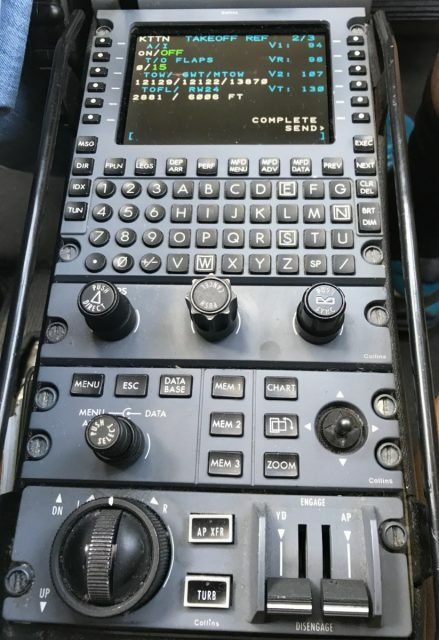 The A5s I flew have a Trig Mode-S Transponder and future production models will have an ES – extended squitter unit for ADS-B out and possibly ADS-B in. After owning, and flying, a number of aircraft my only suggestion would be the addition of a volt/ammeter so you can see the actually battery voltage before start to check the health of the battery and charging rate and voltage during flight. I mentioned this to the ICON folks, as a suggestion for the future. Alternatively, you could use a 12v meter in the accessory receptacle in the center console, which is next to 2 USB power ports. You can see some additions over land planes- the addition of a Purge Bilge annunciator – important when water gets into the airplane structure during normal water operations. Since the wings fold a warning light informs you if the wings or stabilizer tips are not secure. In addition they have a LAND AIRCRAFT light which indicates you may have an impending engine issue and it is in your best interest to get on the ground — or water as soon as possible! ICON is changing the altimeter design, so future aircraft will look slightly different. You don’t need an Exhaust Gas Temperature (EGT) gauge since the ECU takes all of the work of setting the correct mixture, which optimizes the engine and makes flying that much easier. One of the very cool features of the A5, are the folding wings. Utilizing this system you can change the width of the A5 from 35 ft to 7.8 ft, in a matter of seconds. We did it in 15 seconds. The wings fold, and unfold, easily by activating levers under each wing. In order to maintain integrity and greatly reduce pilot effort, the ailerons automatically align when the wings are unfolded back into flying position. 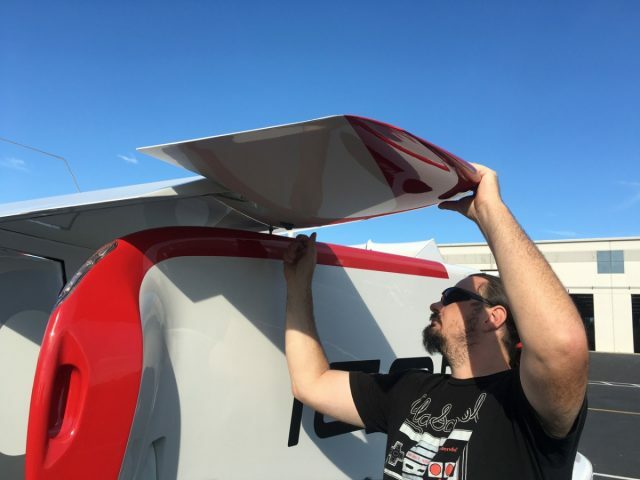 Folding the wing on the ICON A5 from Personal Wings on Vimeo. Then wings are then pulled slightly out and rotated back into the stowed position. Next you need to remove the horizontal stabilizer tips to minimize the width for trailering. Simply turn the lever under the stabilizer and voila – the tips are removed! The bird is now ready for easy storage or transport to another lake, or airport, or both! To say I was excited about learning another airplane, especially the A5, would be an understatement. To me, flying is always about learning and gaining knowledge since my first license in 1977. I couldn’t wait to get my hands on the A5 training materials. 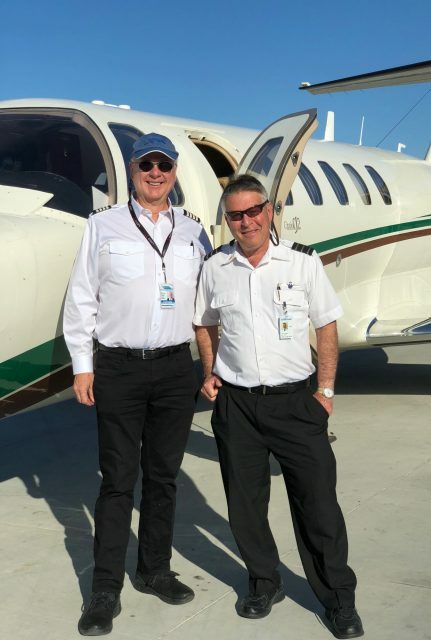 ICON is offering several training programs including; Initial LSA-Land and Sea, Private Pilot Land transition to LSA-SES, and Private Pilot Sea A5 transition. Since I already had my Commercial Single Engine Sea I chose the later course. In some ways I was bummed, since I wanted to fly the airplane more hours! Wendi Hauger of ICON scheduled my training and sent my training materials by email and FEDEX. The materials arrived shortly and I couldn’t wait to read them. Despite already having my ratings, and far amount of experience in 10,000 hours of flying, I read all of the materials to get an idea of their full program. The materials are simply some of the best I’ve seen for initial and transitioning pilots. The course books includes: Sport Flying Academics, Sport Flying Operations, Flight Training Course Guide, and Sport Flying Supplement. ICON is also developing an online course to supplement the information and help with pre-assessment before arriving at their training facilities. The Sport Flying Academics manual does a great job of educating non-pilots on the various areas of flight. 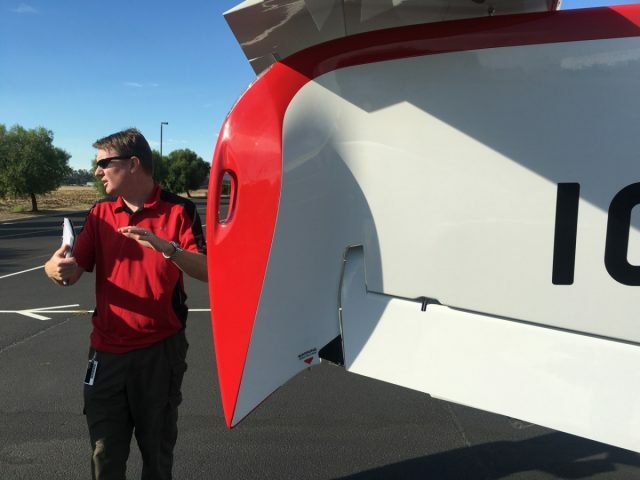 Their discussion, and course flow, on aerodynamics provides a very fluid progression from a simple discussion of why the study is important to encompass all of the information a Light Sport pilot would need, or for that matter at Private Pilot. Their approach, which initially appeared too simplistic to me, began to make more sense as I progressed through the book. As a CFI I would prefer a bit more information on flying into controlled airspace in this manual, however this is covered in a separate Controlled Airspace Endorsement (CAE) Course. In 193 pages, they cover a large amount of essential information. Sport Flying Operations. In addition to expanding on a number of topics from the Sport Flying Academics manual, ICON starts the application of many of these topics to flying the A5. They expand the training emphasis to discuss land and sea operation of the A5. Water operations are inherently more difficult due to all of the different environmental factors (water condition, winds, floating debris, beaches, docks, etc.) which is reflected in the 40 pages on water ops and a much shorter section on landing on runways. The other topics include navigation, weather, hazards, and a great selection of references on items ranging from the FARs to abbreviations. I particularly liked the weather section (maybe since I once worked as an ABC Weathercaster in Oregon) since it takes a large amount of information and presents it in a very understandable format that is useful for Light Sport and Private pilots. Sport Flying Supplement. If you were wondering how to tie knots, or always wanted to know the full mathematical formula for range as it relates to propeller efficiency and L/D, this is the book for you! It also offers a detailed look at Angle of Attack (AOA) and its relationship to many performance factors. Flight Training Course Guide. This guide provides the outlines for several training options: Initial Sport Pilot Single Engine Land and Sea, Transition Seaplane Rating for Sport and Private Pilots with existing Landplane certification, and Transition-Seaplane for pilots that already have the Land and Seaplane ratings are want to learn to fly the A5. The guide discusses the pre-arrival academics as well as a syllabus for each lesson, clearly listed in each section. The first, and currently one, training center is at ICON’s headquarters at the Nut Tree Airport (KVCB) in Vacaville California, near Lake Berryessa which is used for the water training. ICON is planning additional training centers as their company, and the demand, grows. The next training center will be in the Tampa Florida area, with others to follow. KVCB is also where the ICON A5 is being assembled. I flew up from Montgomery Field (KMYF) under VFR conditions in a friend’s Piper Mirage that I borrowed for the trip. The flight was only a bit over 2 hours in smooth skies at 16,500 ft. Of course, I had to bring one of my bikes along for local transportation. I arrived early in the morning on my bike before my instructor and had a chance to checkout the planes. The line staff were getting the planes ready for training. They did a great job of ensuring all of the aircraft were fueled and ready. They also were very helpful answering my constant questioning about the aircraft and the systems. The ICON Flight Center has a very good training facility with classroom and briefing rooms. After registering with Ariel Andrus, I was paired up with Shane ‘Sully’ Sullivan, a former Navy F/A-18 and P-3 pilot. My classmate was a Private Pilot without a seaplane rating, so after an introductory session we split off for my transition training. ICON describes their ground sessions as ‘Ground Labs’ and the information was presented in a very interactive method. For me it was focused on the characteristics of an LSA and the A5 in particular. Since I had reviewed all of the material prior to class, the process went very quickly. Since this is a Light Sport Aircraft, one thing to remember is the keyword ‘light’. It responds differently to high winds and the control forces are lighter than most General Aviation aircraft. I found that not to be an issue, but always reminded myself that crosswind landings might be slightly more challenging, however its maximum demonstrated crosswind (an FAA definition) is the same as a Cessna 172. In flight I found it to be an extremely responsive aircraft, you just need to adjust to its characteristics just as with any other aircraft. My airplane for the day was the first production A5 which was generously donated to the EAA and temporarily is used on the ICON training fleet. The preflight inspection is straight forward for an amphibian! As with all aircraft you check the general condition. 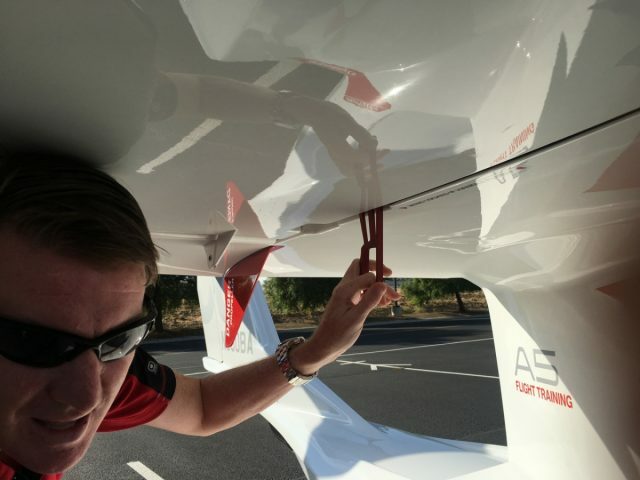 Since we have folding wings and removable stabilizer tips, you have some additional inspections as noted above by ensuring the wing release handles are secure and the stabilizer tips secured. The cockpit also has an annunciator in case these flying surfaces are not locked. The seawing (horizontal surface on the fuselage) makes it easy to step up and check the air intake and oil level. With the windows out – and deflectors installed – limited to 90 KIAS but very cool to fly without windows! 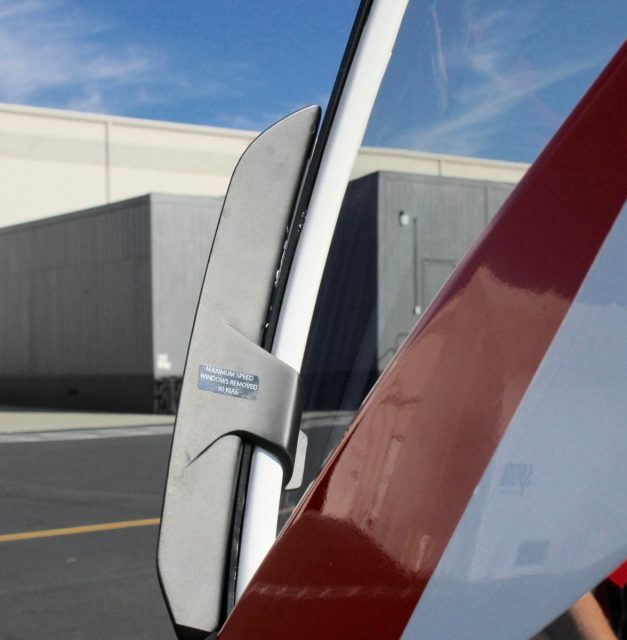 ICON A5 Water Rudder – check for security and ability to manually push up – You don’t see this on your typical Cessna! Up, Up, and Splash – Time to Get Wet! Starting couldn’t be easier. After doing our cockpit check (securing belts, brakes, CAP pin removed, etc.) you simply turn the master on and move the ignition to ‘Lane A’ wait 6 seconds while the ECU performs tests, then do the same on ‘Lane B’, turn to both and start. The Rotax starts easily – every time hot or cold. I increased the RPM to 2500 to excite the alternator and do a few checks, then off to the runup area. At the runup area you check the ignition system, similar to a mag check on legacy engines, verify everything is operational and proceed to the runway. The A5 literally leaps off the runway in a short distance when I rotated at 50KIAS with flaps up. Gear retraction, and extension, is 75KIAS so relatively quickly the gear was up after clearing obstacles. I climbed at Vy (best rate of climb) – 60 KIAS, with initial rate of climb (ROC) of 500+ FPM. To be the most efficient you fly by AOA – white line for Vy. The plane is a dream to fly! Just to the north of Vacaville is the lake, with the dam on the east side. On the first day, I flew over the dam and headed for the main portion of the lake. Since you have so much flexibility to land on lakes and the ‘runways’ are not marked obviously, and you share the water with other watercraft it is very important to stay vigilant. Descending to the lake, I take care to look for power lines, especially since this is a hydroelectric dam, that extend across the hill tops surrounding the lake. Since the best way to operate an aircraft is by flying the optimum Angle of Attack for a particular maneuver the only accurate way to determine it is to use an AOA indicator. ICON uses an intuitive approach – with basically three references – on green line, on white (dashed) line and yellow line. 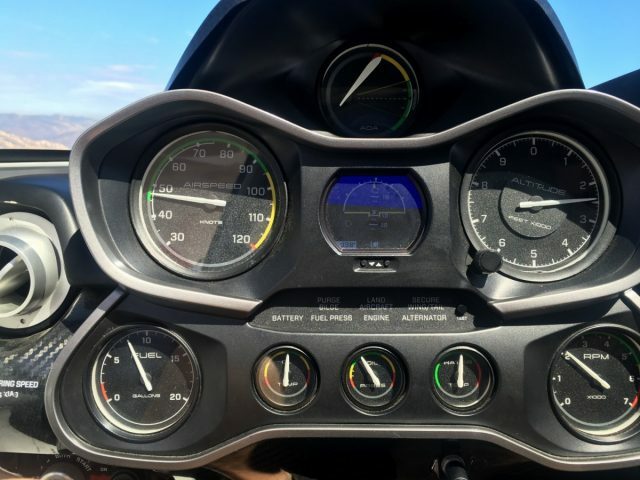 As your speed increases the indicator progresses towards the top of the green – which is high speed cruise. The red line represents the stall mentioned above. Since AOA for a particular maneuver should be always the same degree, however the Indicated Airspeed (IAS) will change depending upon weight, flap configuration and G-loading using the AOA indicator is preferred. This is the same reason turbine and military pilots rely on AOA. I don’t know what can be more fun, flying at least, than landing on water and the A5 definitely seems like a duck in the water! Approaching the water it is time to do the pre-landing checklist. 1) Gear UP for Water, indicating up 2) Flaps 30 degrees, 3) Water Rudder UP. I always like to repeat the Gear check, 3 times, on downwind, base leg, and final — just in case ! Using the AOA indicator for water landings is so cool! In the A5 you simply start your approach at an AOA on the ‘On-angle white line’ and keep that value until on short final. 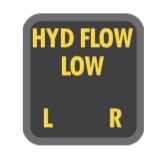 As you slow down for landing just a few feet above the water you slow down to an AOA in the middle of the yellow, which is approximately 1.3 times the stall speed with the flaps extended. You can also land a bit faster if you are landing on a glassy surface. In the video you will see how smoothly you can land on the water, in this case we were practicing on ‘glassy’ water which can be more challenging since you may not have adequate references for height above the water. Okay you are flying into a lake and now you want to get on land. You can use a dock, drive up a boat ramp, or what is really fun is to park on a beach! On my first beaching, we chose Eagle Island – aptly named due to some eagles nearby. From the air it is difficult to determine the true condition of any runway – land or water. With water landings it may be more difficult since there may be submerged sandbars, tree stumps, and rocks. Beaching can be an even bigger challenge. The first order of business is to evaluate the landing area, then taxi by the beach after landing for a closer look, followed by a slow taxi towards the beach. 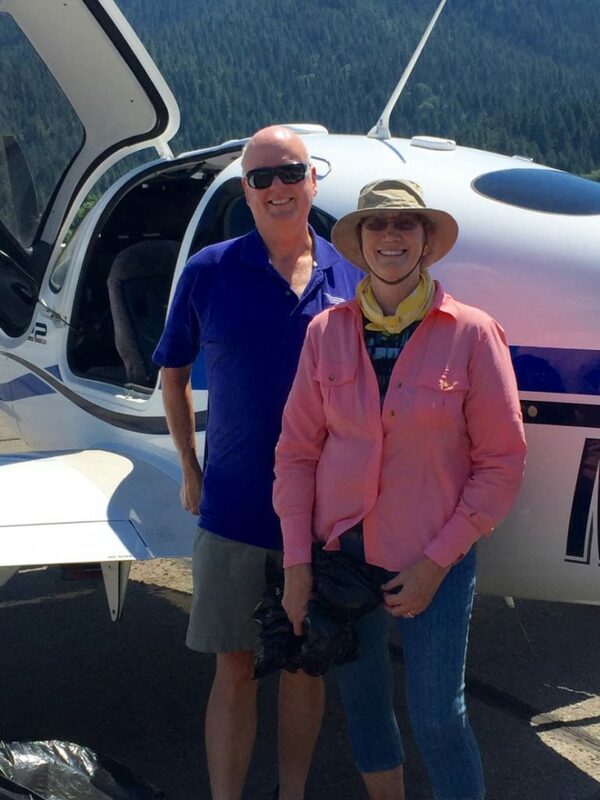 On Day 2 of the Transition Training, my second CFI – Mike Turner, and I decided to practice a confined area landing on the way to the same beach. Approaching the landing area, I was a bit slower than usual flying the AOA at the top of the yellow on base leg, then half way in the yellow for landing. After landing, you can see a high speed, or step, taxi to the island, then a turn to survey the area. As we approached the beach I shutdown the engine, removed headsets and seatbelts and prepared to get wet. As you probably noticed on the video, when you stop on the water – water comes over the bow into the air vent as you decelerate, on your feet, then into the bilge. The A5 has a water sensor, and when it illuminated, I simply turned on the bilge pump! On the way out, I snapped a photo of one of my classmates, Burt, departing the island. Since the A5 sits low in the water, you need to be careful when beaching on sloping surfaces or at docks. To explore steeper beaches, we tried another island to experiment. As you can see you have to be careful when using these beaches to avoid damage to the wing tip, or changing tides and water levels. Beaching the A5 on a slope – note how close the wingtip is to the beach. 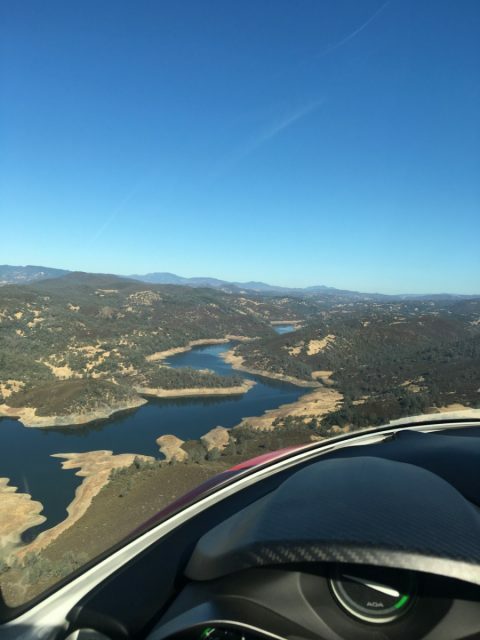 Lake Berryessa is a great place to cruise, especially over the water in the A5. One of the rivers that feed the lake is Putah Creek. We dropped down and followed the creek back to the lake for more fun! 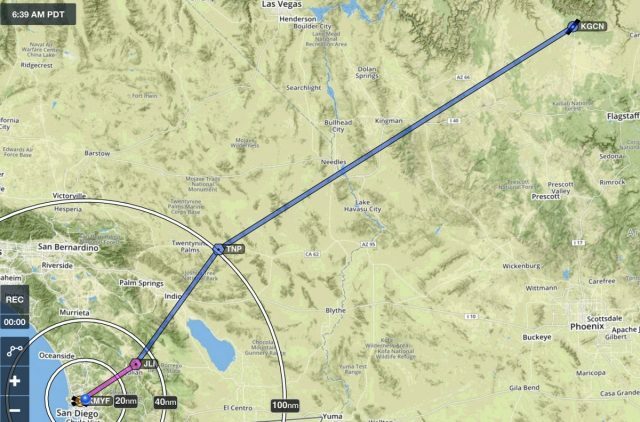 On the way to the lake on another flight from Vacaville, I did an emergency descent, reducing the power to idle and gliding at white line on the AOA all the way to the water. With a glide ratio of 9:1, the A5 glided effortlessly, and I kept my intended landing spot in the same sight picture. Close to the water, I extended my flaps to 30 degrees, continued to slow to an AOA of mid-yellow for a smooth landing on the water. After landing, I increased power to do a Step Taxi at 30 kts under the power lines suspended over the lake and then transitioned back to a take off. As you can see in the video, the plane glides very well with the AOA stable on the white line, with a pitch of between 9 and 11 degrees from an elevation of 3300 MSL (feet above Mean Sea Level) to the water surface at 440 MSL. Again a great example of using the AOA. Simulated engine failures after takeoff, etc. were equally as simple. As long as the pilot monitors the AOA, it is an easy process to consistently make a safe landing. This will be brief, mainly since I had so much fun on the water I didn’t want to spend much time on the runways. The A5 is very simple to land, as long as you use the AOA and fly stabilized approaches you can consistently land the plane exactly where you want. Of course, you always want to follow the checklist – especially ‘Gear DOWN for Runway – Indicating down’. Whether you use flaps, or not, the A5 doesn’t use much runway and the pitch attitude is similar to my SR22 – just about 5 degrees nose up on touchdown. It seemed my two day transition course was way too short, in fact we added an extra 2 hours just to have more fun before heading back to San Diego. Flying floatplanes is such a kick, and flying the amphibious ICON A5 has to rank up near the top of my flying experiences. 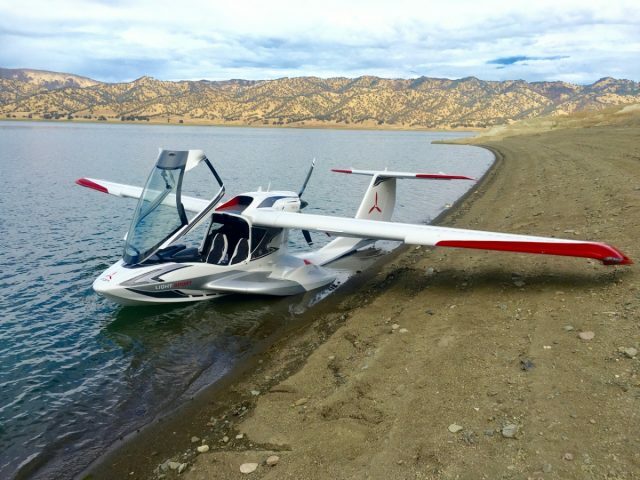 It isn’t a fast cross county airplane, can’t carry a large load of people or baggage, and may have other limitations but that isn’t why you own or fly an ICON A5. You fly an ICON A5 to have fun flying, on land or water, and have experiences that are only available with a handful of airplanes. The design, quality, and shear pleasure of flying the aircraft left me with a big smile on my face, and a desire to fly it again! If you’d like to learn how to perfect your flying skills, contact me to schedule an instruction flight. Don’t forget your sandals! 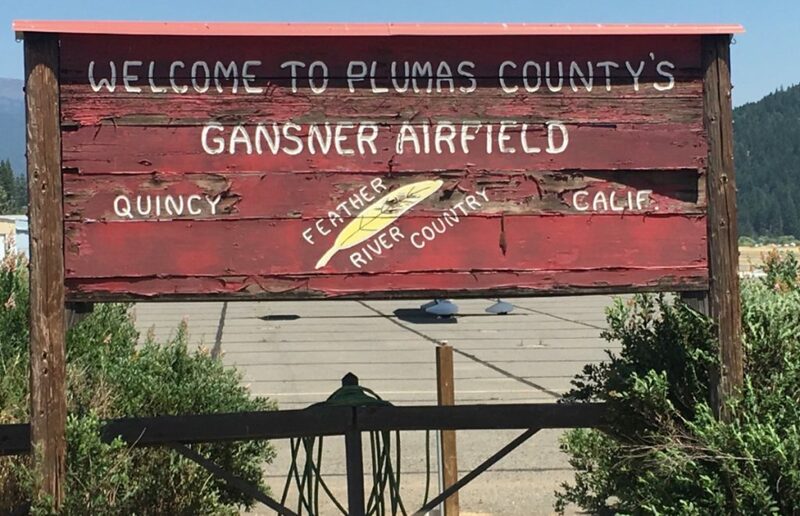 We’ve been flying to Quincy CA – Gansner Field (2O1) since the early 1980s and it never fails to be a magical place to visit. 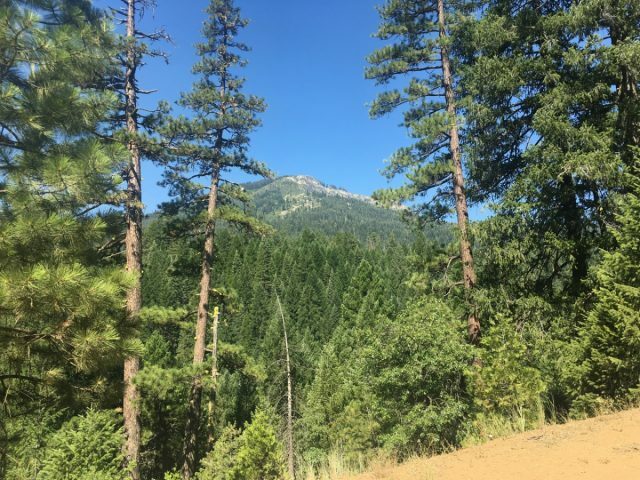 Located in Plumas County and the Sierras it is a small logging town that has a lot to offer. We first flew to Quincy from our home in Klamath Falls Oregon in our Grumman Cheetah. 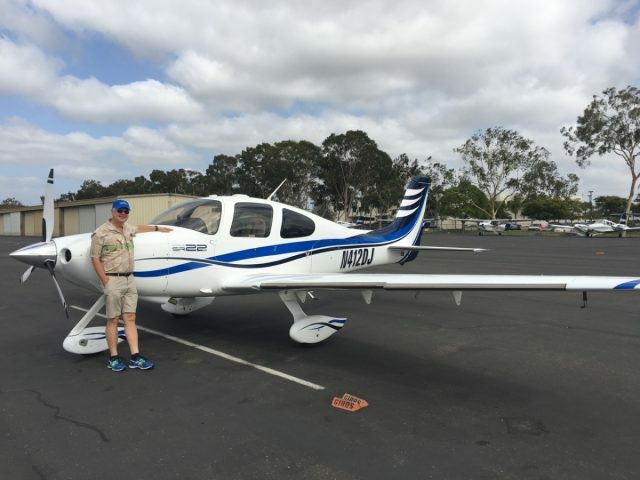 This time we were visiting Quincy to attend the awesome High Sierra Music Festival (HMSF) for the second time from our home in San Diego CA (Montgomery KMYF) in our Cirrus SR22. Not to be content with just attended the festival we also brought our mountain bikes to explore the mountains and to get around the town and festival! The flight was smooth under clear skies, with a few knots of tailwind, it was a nonstop flight of 2:50, over scenic terrain and vistas. 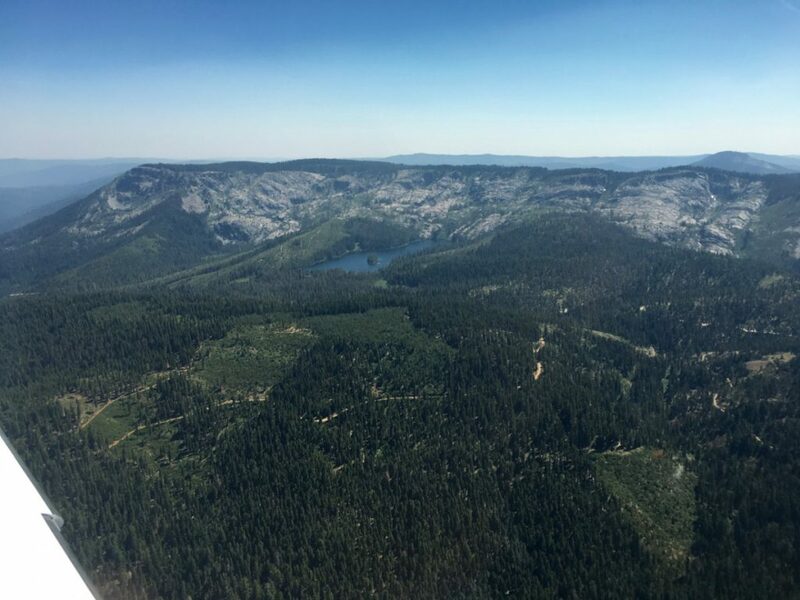 Our flight followed the western slope of the Sierras, with only one deviation to stay clear of the restricted airspace near Edwards Air Force Base. Our flight to Quincy – Red Circles represent forest fire activity and Temporary Flight Restrictions (TFR) for firefighting. Since this is high fire season we did see a fire that had just started west of Auburn CA. In the 1980s I flew for Weyerhaeuser during the summer monitoring their forests for fires. I remember one particular flight in northern California after a lightning storm in 2008 that spawned more fires than I could count. 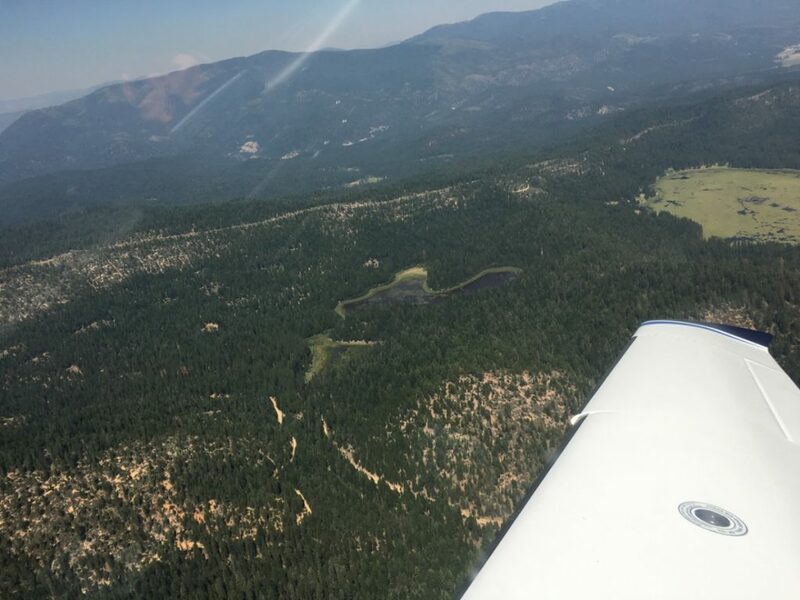 On the way up to Quincy we spotted a few airports for future visits, Blue Canyon (KBLU) and Columbia (O22) , both look like great hiking and biking spots. We always like to survey the area before we land. 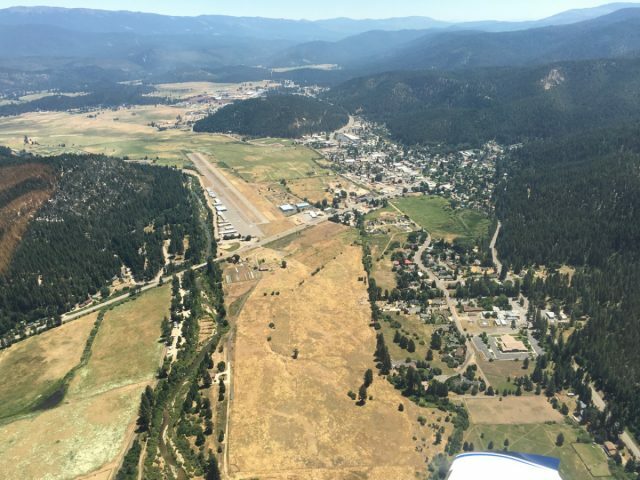 It was great to fly over the valley, circling the festival venue at the Plumas County Fairgrounds, our favorite swimming hole on Spanish Creek (more on that later), the town and of course the airport. We were arriving on the first day, so it was pretty quiet in town and the airport. The airport is in a narrow valley, which makes some of the approaches, and departures, a challenge. To the west is a even narrower valley between the hills that requires a dogleg to the right during the climb, so proper planning is important. Immediately to the north of the runway is large hill. 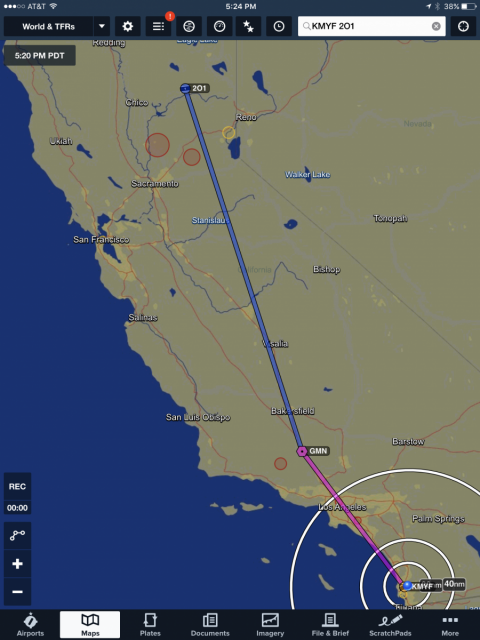 We circled north over Spanish Creek, then entered a right base and then final to Runway 25 (length 4100 feet). The runway is a bit rough, however it is quite usable and they have a great price on self-serve fuel! Bring tie-downs since the current ramp area doesn’t have them. 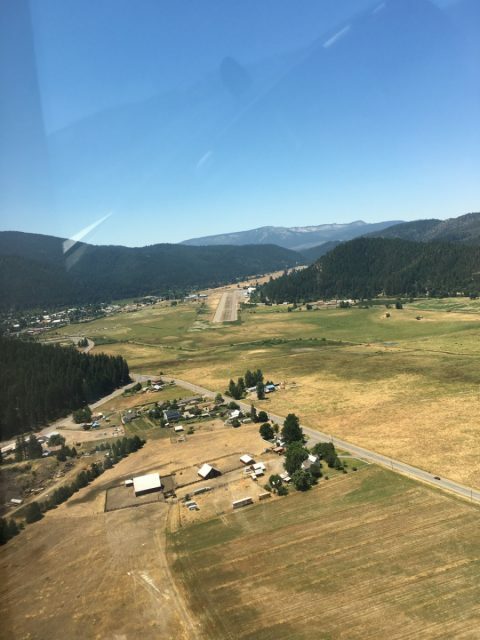 Plumas County is also engaged in a program to upgrade the airport, so you may see improvements on your visits. Quincy Gansner Field East View Runway 7. Quincy is to the right of the airport and the Fairgrounds east over the small hill. 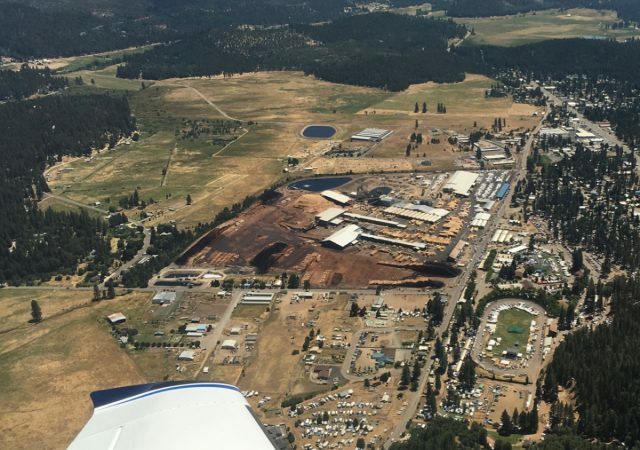 High Sierra Music Festival Aerial – at the Fairgrounds just to the right of the lumber mill. We were staying at Ada’s Place, a great collection of cottages in Quincy. Mike Nellor of Ada’s Place, greeted us at the airport to help with our luggage while we rode the bikes to the cottages. Mike is a veteran with some great stories, and his wife Valerie is also a very gracious host. We rode our bikes the mile to our cottage with Mike ahead in his truck. Ada’s Place is the perfect place to explore Quincy all year-round whether you are biking, hiking, or just exploring the area. The town of Quincy is one of the friendliest places to visit. 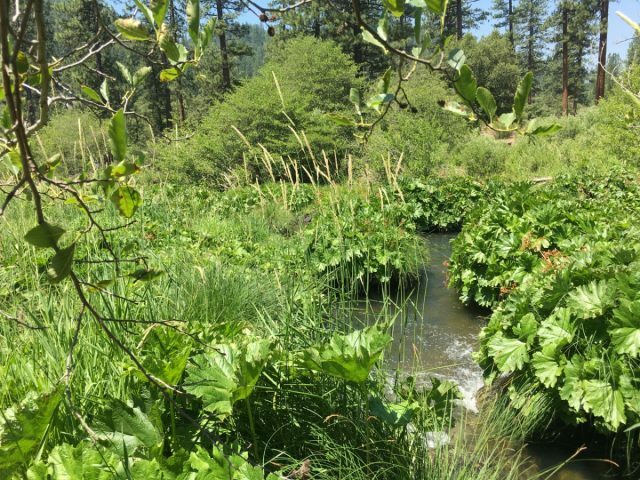 Located approximately 80 miles Northwest from Reno it is in a very scenic area with year-round activities. The Plumas County Museum, adjacent to the courthouse, displays an interesting history of the area including it’s rich mining history. The Natural Food Store (Co-op) is on the main street, as well as a Safeway and other places to stock up on supplies. On Thursdays during the summer there is a nice Farmer’s Market just by Ada’s, at the Dame Shirley Plaza by the courthouse, that features local produce from the region, crafts, and music. One of the unique aspects of the area, are ‘barn quilts’. There is actually a Barn Quilt Trail in Plumas County with many of the art pieces displayed in Quincy, on you guessed it – barns! We had fun riding out bikes around the area and discovering this unique public display of art. The town is quiet at night, so just make sure you scope out the restaurants, etc. if you plan to eat late since their hours may vary. We had great food, at very reasonable prices, throughout the town. We had wonderful salads and sandwiches at Pangea and the West End Theatre, which is also home ot many performing arts events. The local residents were also very helpful in guiding us to great places to eat, bike, and visit. There is something magical about music festivals, and the High Sierra Music Festival matches our vibe, funkiness, and eclectic music tastes ! Smaller at 8-10,000 attendees, than some of the other multi-day festivals, it offers a great chance to see a wide variety of artists (music, art, performance), see old friends and meet a lot of new ones! Jane, Rich and a friend at the Vaudeville Tent. My shirt is from our last visit to High Sierra. With music all day and night, available from morning until 3 or 4 a.m. we had ample opportunity to watch some great artists. 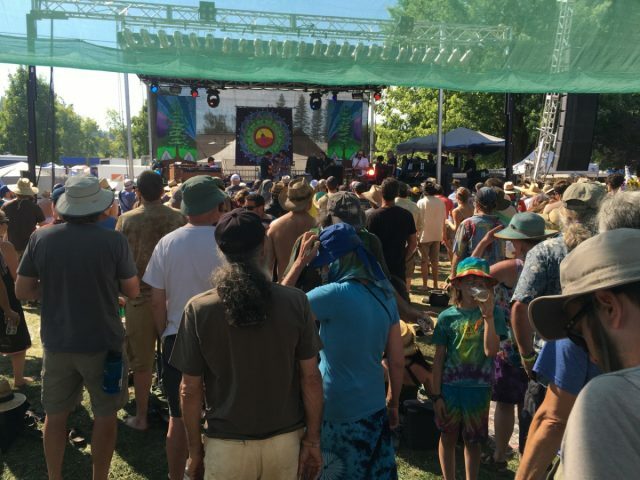 HSMF has a number of official venues: Vaudeville Tent, Big Meadows, Grandstand, Music Hall and others, as well as a number of ad-hoc music areas that offer spontaneous jams. With music continuously playing, if a certain genre doesn’t interest you, simply find another! 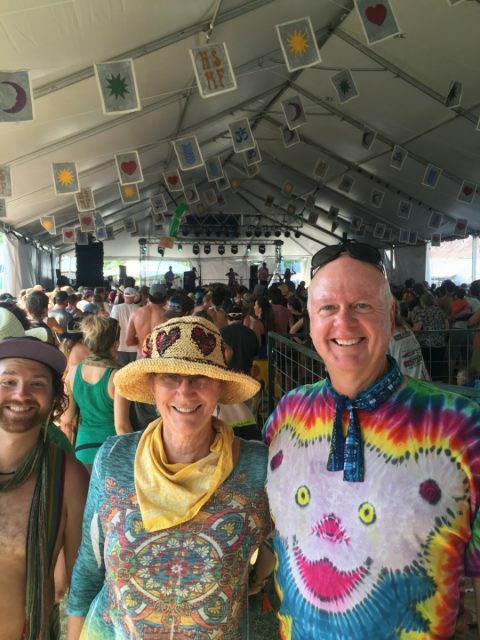 With such groups as Ben Harper, Tauk, Turquaz, The California Honeydrops, Liz Vice and 20+ others, the difficult decision is where to go 🙂 Most of the time, we would listen to artists for a while, then venture to another venue to catch another great performance at the same time. It was just wonderful to dance to music, some familiar and most not, with so many very happy people. The energy was so positive, that it still puts a smile on my face! Seeing families attend, and young parents hauling their kids in wagons around the grounds and camp areas was great. While we didn’t camp this time, the energy and community in the campgrounds was palpable- with everyone helping others. It almost enticed us to try camping again ! For those inclined to listen to music until 4 a.m., High Sierra also offers late performances starting at Midnight. We listened to The Main Squeeze on Friday night. Many of the musicians play at other times, however these performances are usually in a smaller venue which is nice as long as you can stay up very late, which can be helped by copious consumption of Red Bull! The HSMF abounds with various performances to watch, whether you want to watch or participate! From art classes, to tie-dye instruction, to how to Jam, or yoga. One of our favorites is the Parade. 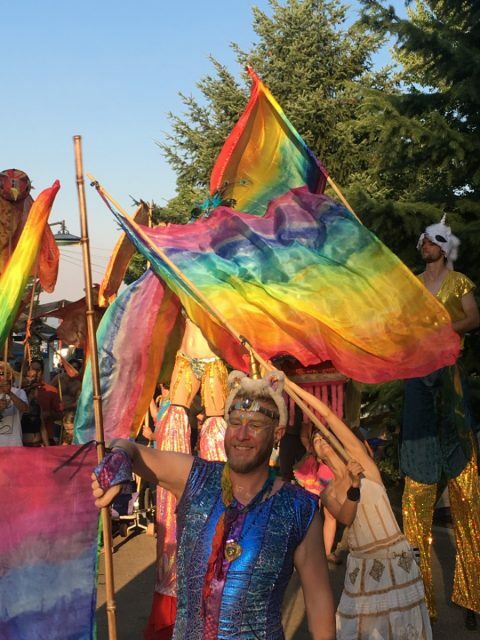 While there are ‘official’ (if there is such as word at HSMF) performers, it is open to anyone who would like to hold a puppet, flag, or whatever. One of the favorite groups are the men and women of Samba Stilt Circus!! I don’t like ladders so I am always amazed with their performance. It is just one of the high-energy aspects of High Sierra! High Sierra 2016 Parade from Personal Wings on Vimeo. 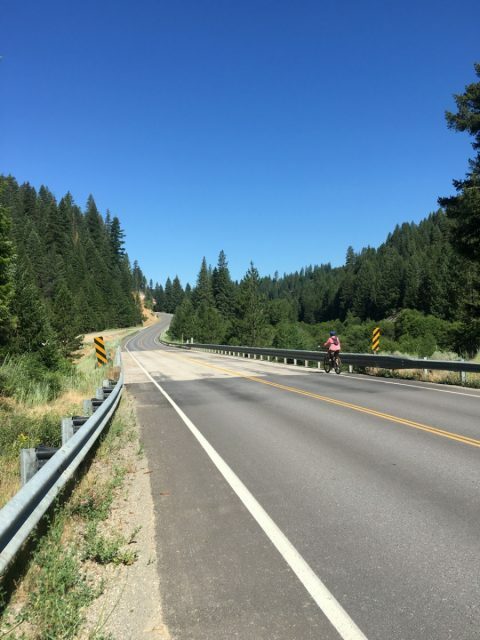 Plumas County is a great place to bike, and now is one of our favorites ! Okay, I love just about any place I visit but this is really is great :). On Friday morning after a late night of music, we thought we would warm up with a 20 mile ride up the mountains to Snake Lake and back. The road to Bucks Lake follows a beautiful canyon up to, you guessed it – Bucks Lake! Mike at Ada’s Place recommended visiting Snake Lake on the way, a place he likes to hike in the early morning. After our first late night of music, it seemed like a good warm up ride, only 10 miles away up the canyon. Winding road to Bucks Lake – Spanish Creek is on the right of the road. Aerial view from our SR22. Even the ride up the road towards the lakes was beautiful, with us stopping along the way to enjoy the scenery. 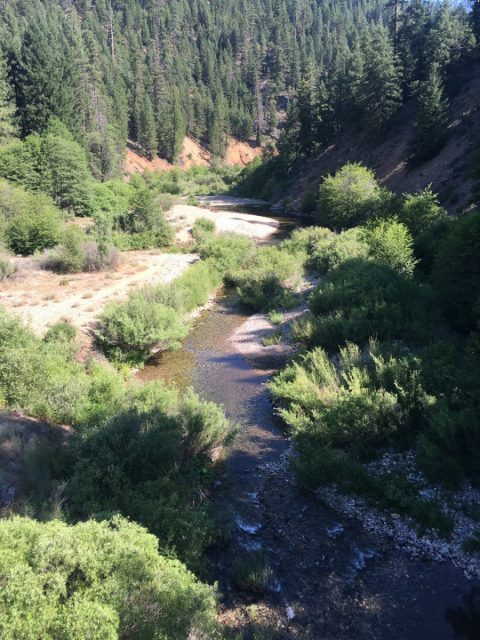 Plumas County was one of the first locations of the California Gold Rush. Some of the towns are no longer present, however you can still find some old mines and active mining claims in the area. This sign, along the road, describes a 20 mile ditch that was manually dug to bring water for the mining. 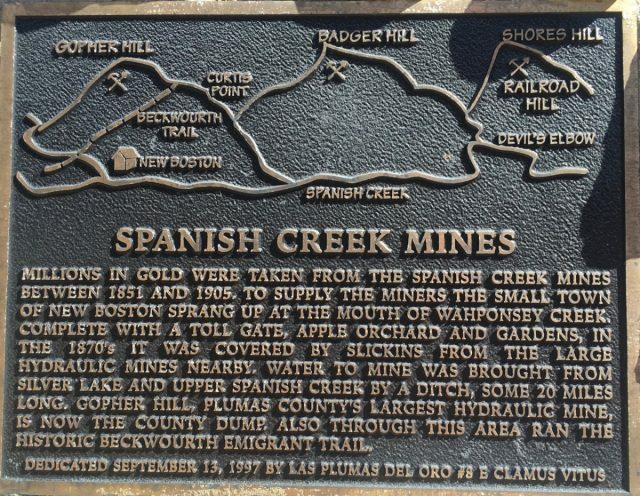 Spanish Creek Mines Interpretive Sign. 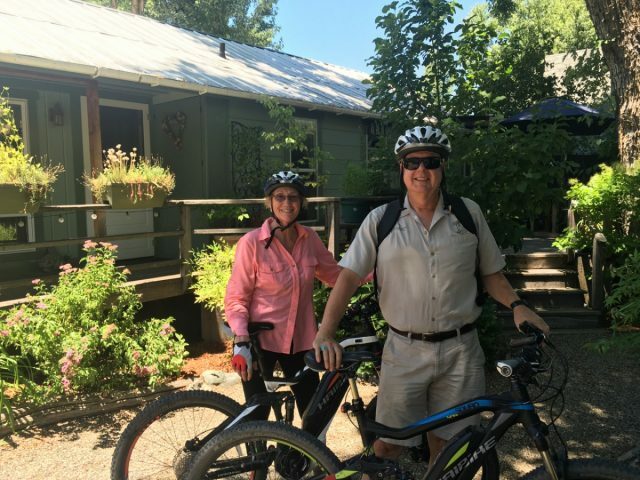 We were riding our Haibike e-assist mountain bikes from the Bicycle Warehouse in San Diego. While the bikes still require a lot of pedaling, it is amazing how just some assistance from the 400W motor helps with the climbs! While we have always loved to bike, these pedal-assisted mountain bikes have increased our riding range by many factors. In the first two months, I’ve biked nearly 400 miles on trails and roads. Six miles up the Bucks Lake Road from Quincy you turn right at the bridge. It is important to know where to turn because there are no signs! Thanks to Mike Neller we knew where to turn. Three miles up on pavement and gravel you arrive at the first campground at Snake Lake. We use various apps for navigation, and still haven’t found the perfect one for biking. One that comes in handy for offline maps (important when you don’t have cell service) is Offmaps which utilizes open source maps. I’ve used these maps in Haiti when helping after their earthquake in 2010 and nothing else was available. It isn’t perfect, but it can help you from getting too lost! I’ll write about other options in a separate blog. 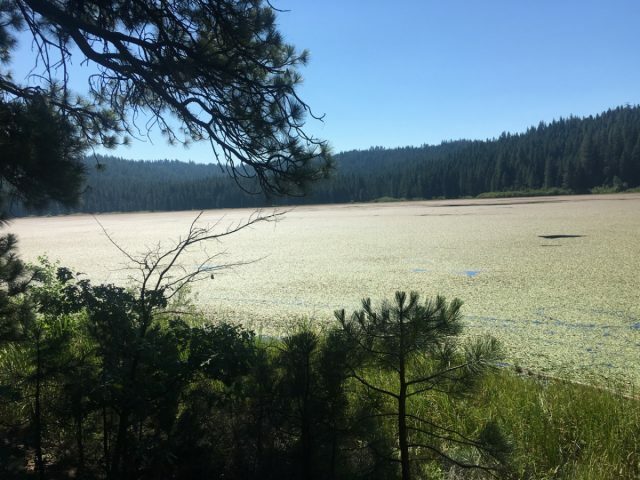 The lake is being overcome by non-native plants, which is regrettable since depletes the nutrients for other life, but it is still a nice place to visit, ride your horse, and hang out in cooler temperatures. 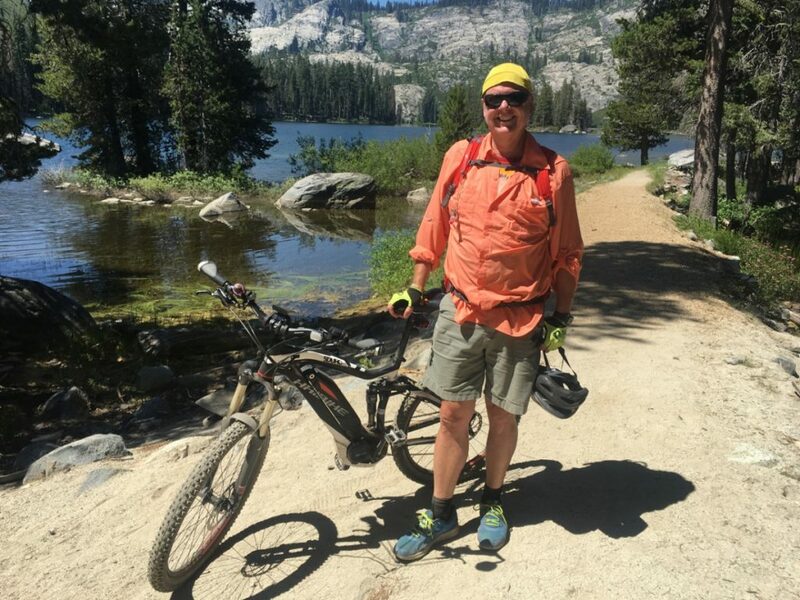 The bike ride is a moderate climb, especially if you venture around the lake or go up to Smith Lake, a smaller lake nearby that has water seasonally. We ran into people camping that were extremely helpful, pointing out other places to ride and hike. 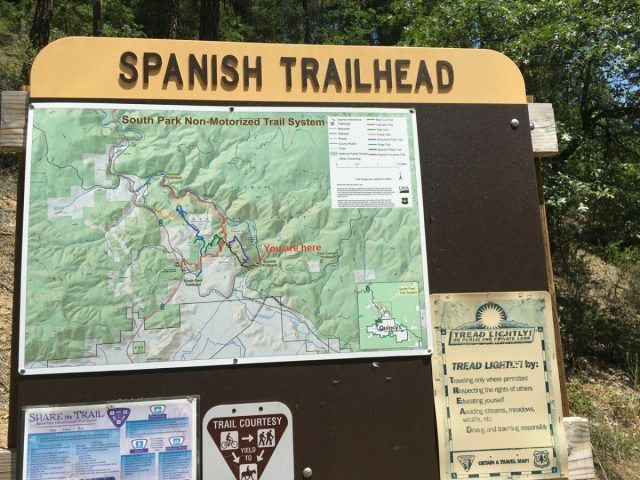 On Saturday after a great day and night of music from TAUK, Turkuaz, Main Squeeze and others, we headed to the many trails along Spanish Creek, also near a fun swimming hole! Riding just east of the airport along Quincy Junction Rd. it is an easy ride up to the trailhead. This is one of the trailheads for the South Park Non-Motorized Trail System, basically where you want to ride! The map is clearly labeled, if you actually read it 🙂 I led the way to the right, thinking it was the way to the easier route. Quickly we found that not to be the case. 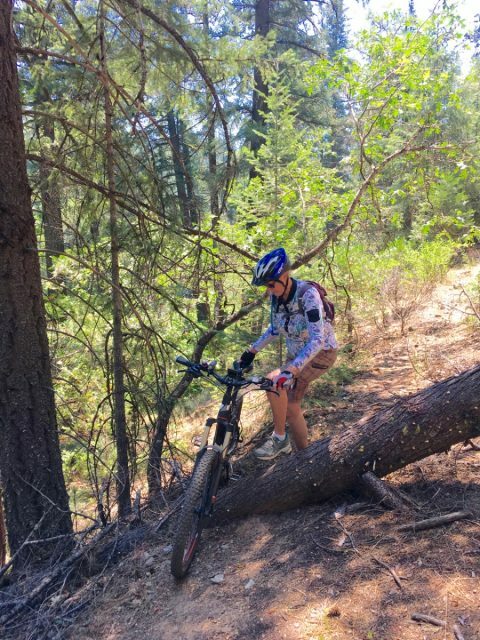 Maybe this isn’t the right trail…. We decided to continue, because you don’t know what is around the corner until you try it. When you have to navigate over large obstacles, you realize that the e-bikes can be a bit ponderous to pick up and move. I would have helped Jane, except someone had to take the photograph! Of course, around the corner were some beautiful sites of Spanish Creek, small waterfalls, and vegetation. The trail faded more and more, until we couldn’t find it any more and it was time to turn around, of course we had to go through a few obstacles the other way. 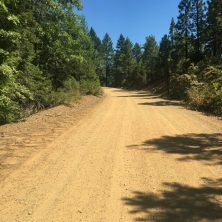 Just to the right of the Trailhead is a road that leads up to the Oakland Recreation Camp, and a very nice access road that progresses up the canyon on the east side of the creek. A helpful ranger pointed out some swimming spots along the creek that offered a quiet, and private, access to the creek about a mile from the camp. 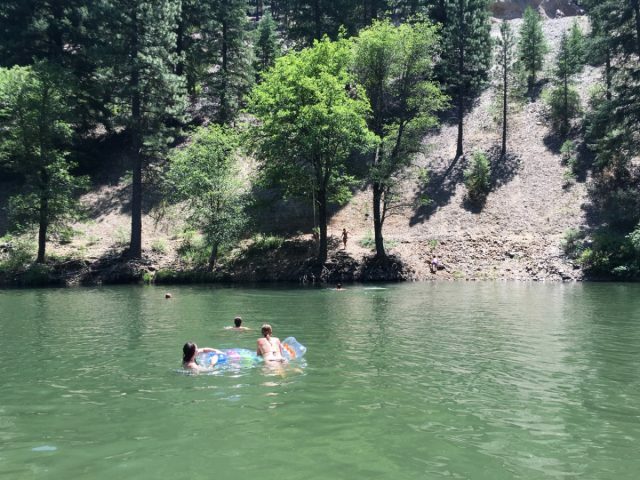 Just before reaching the Trailhead is a more accessible, and public, swimming spot that is great when it is hot. Sometimes the water can be quite chilly, but this day it was probably in the upper 70s. I decided to take my shoes off and just wade in a few feet. Why should I change into a swim suit when all I was going to do was cool off a bit. The water was great, so I went a bit deeper, taking out my iPhone to take photos. Before I could say ‘High Sierra’ I was totally submerged, clothes, wallet, and backpack. I handed my phone to someone standing on the edge and emerged a bit wet but a lot cooler from the ride! We ventured back to the Festival for the evening and more music, and thought about another ride before we would leave for home on Sunday. On Saturday night we listened to Anders Osborne, Lettuce, Ben Harper and the Innocent Criminals. What a great way to listen, and dance, to a variety of music with great weather and friends. Of course it is always fun to ride a night, and we took a short cut along a fun trail back to the cottage at midnight. We were now psyched to bike to a higher elevation before leaving for San Diego. We decided to try Bucks Lake, approximately 17 miles from Quincy up the same road that led us to Snake Lake. With a full charge on our Haibikes we were off. The road past the Snake Lake turnoff is windy and fun, with a number of narrow sections and all of the motorists were courteous. One of the nice features of the e-bikes is the speed you can maintain along the roads. While the top speed for the assist on our bikes was 20mph, it was enough to help us go faster. 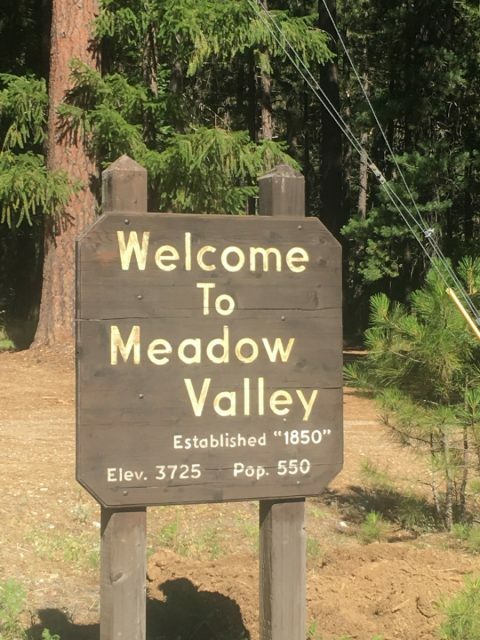 Along the way to Bucks Lake you enter Meadow Valley, a small town with a great country store, and beautiful views. We had gained about 1,000 feet in elevation. Just past Meadow Valley, we came across a turnoff with a sign to Silver Lake. Jane thought it sounded like a nice place, and since my navigation has led us down a difficult path on the last ride, we decided to take her suggestion. The initial approach to Silver Lake looked very nice. The roadway was smooth and there was no traffic. As we rode around one of the corners, and the grade increased on the road, we saw Spanish Peak in the distance and thought we were glad we weren’t going up that far. With the climb becoming steeper it was great to stop and take some photographs of the views. We kept out checking our odometer, and battery charge on the bikes. While we knew we could always rely only on pedaling back to Quincy, there were some steep climbs still ahead of us. With each turn around a corner we were getting either closer, or more lost, and each view of Spanish Peak was getting closer. 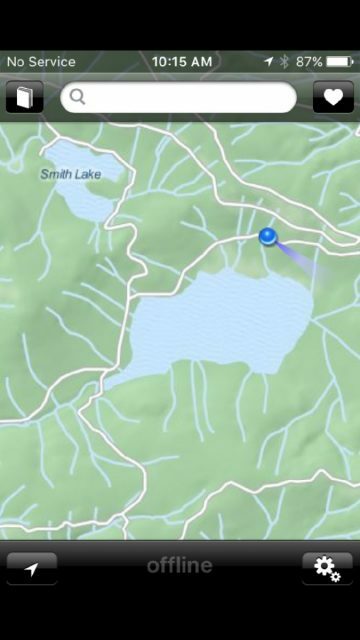 We finally deduced that Silver Lake was probably high up on the peak. Jane and I traded bikes on the way up so she could try my dropper seatpost and my bike had a higher charge level. The last segment was probably the steepest, later we learned that our steeped grade was 16% with many grades above 8% on the way up. We finally made it to Silver Lake and it was worth the effort! 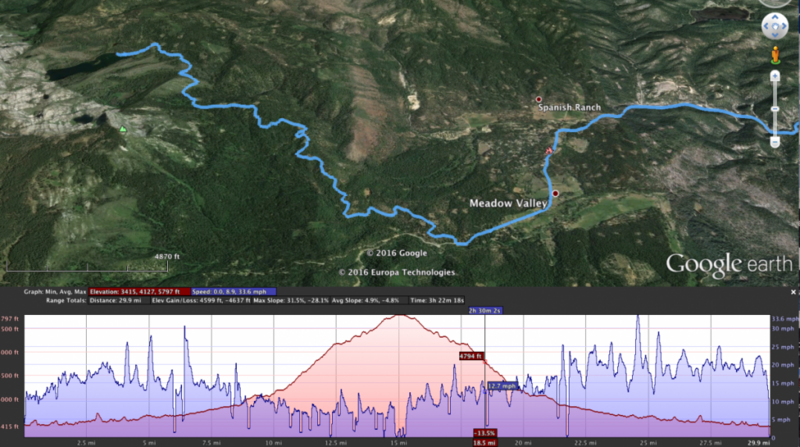 It was 16 miles from our cottage, 1 hour and 35 minutes, and an elevation gain of 2400 feet. We only stayed a few minutes up at the lake, however we found some great hiking trails for another time. We met some local folks from Quincy who were extremely helpful, and amazed we rode all the way up from Quincy. They typically don’t see older bikers this far up the mountain! The way back was obviously faster! At Silver Lake our e-bikes registered 16 miles range on High, 19 on Standard, and a bit higher on the 2 lower settings. We knew that we wouldn’t need much help on the way back to Quincy, however there were some steep climbs on the return. The range is approximate and is determined by how much you use the assist. We stopped at Meadow Valley for some water for the hydration packs. Note to self: you can never have enough water 🙂 By the time we arrived back at Quincy we had 6 miles left on High and 9 on Standard. Second note to self: Bring a charger when biking in the mountains! After a great lunch at the West End Theatre, and saying good bye to our friends, we headed back to the airport. We also wanted to take some aerial photographs of where we had biked on the weekend. 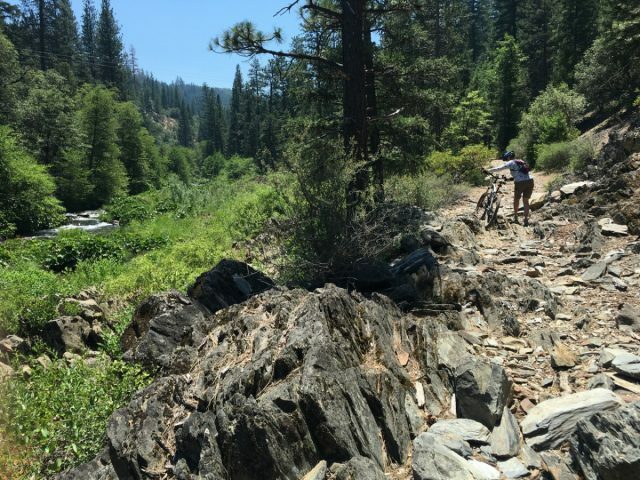 It was a great way to spend several days, flying to Northern California, mountain biking, spending time with friends, and enjoying music. 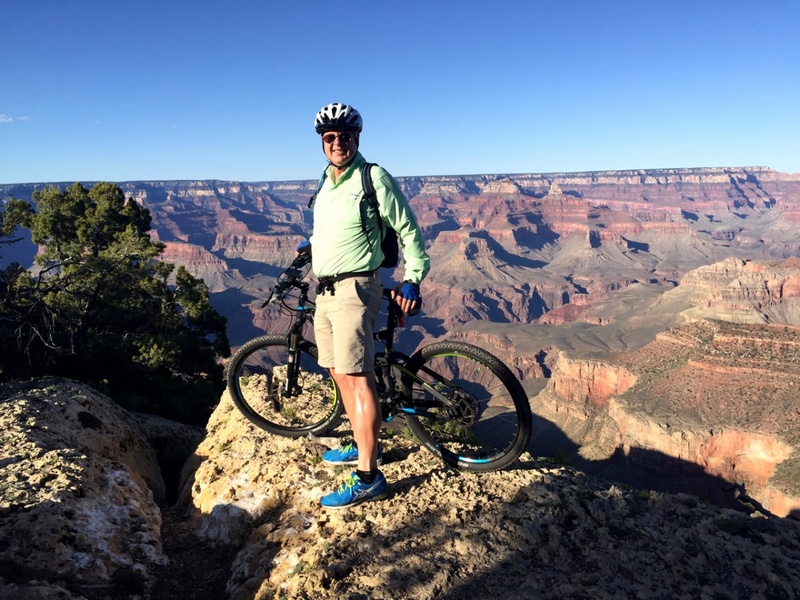 Four weeks after breaking my ribs while mountain biking in Sedona , I was back on the bike in the Grand Canyon National Park in Arizona. 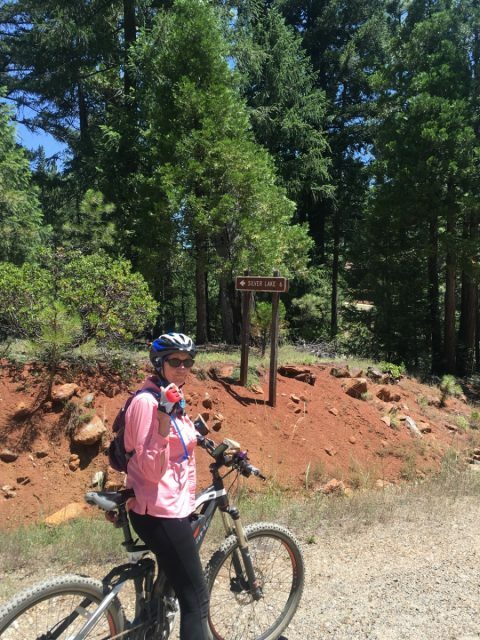 Biking the South Rim of the Grand Canyon is quite different than Sedona. 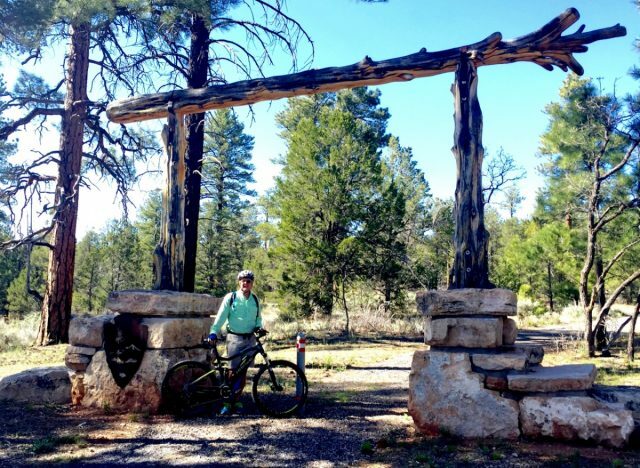 While Sedona prides itself on a wide variety of amazing technical trails – very few if any are at the novice level, the riding at the Grand Canyon NP is restricted to the fire roads, trails, and paved roads. 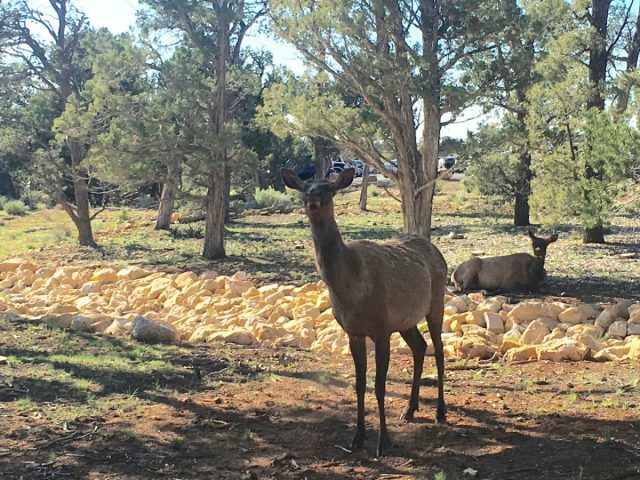 The North Rim offers more challenging trails in a fairly remote area in the Kaibab National Forest, in particular the Rainbow Ridge Trail. Each one different, with their own amazing qualities. I flew to Grand Canyon (KGCN) airport from my home base in San Diego (KMYF – Montgomery) in our Cirrus SR22. The enroute weather was perfect VFR, virtually clear skies with unlimited visibility of at least 100 miles. Only an occasional bump, interrupted the beautiful flight at 9500 Ft MSL. Using Air Traffic Control (ATC) Flight Following, it was a direct flight taking only 2 hours to arrive at KGCN. 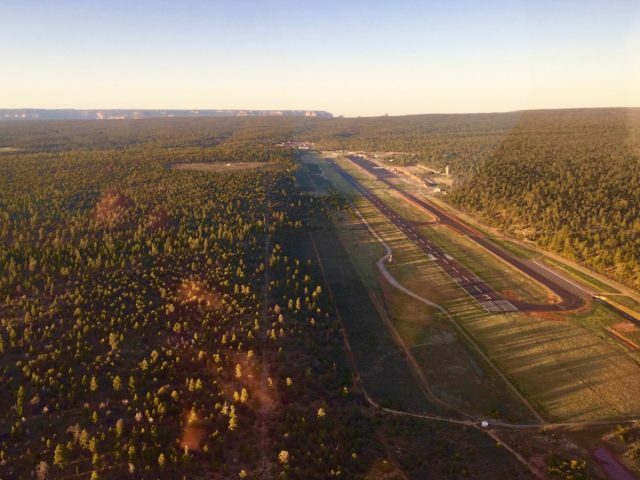 The Grand Canyon airport is just outside of the Grand Canyon Special Flight Rules area, which restricts flights over the canyon itself. We were greeted by a very helpful control tower staff as well as Dominique the lineman with Grand Canyon Airlines, the fuel concession as well as the charter operation at the airport. Ten minutes after landing, it was time to ride! 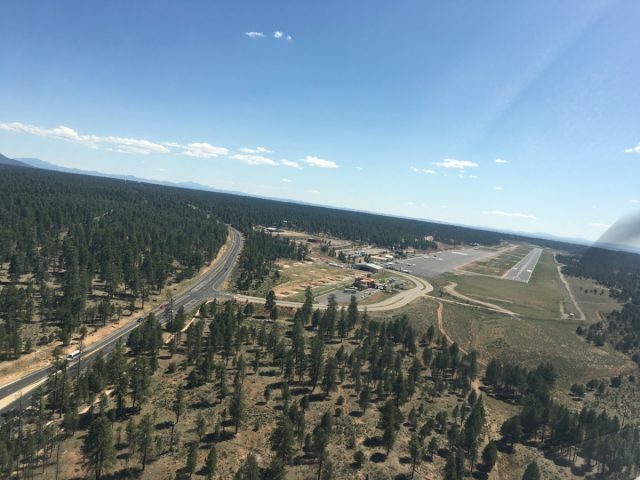 While the Sedona airport is on a Mesa, GCN is on a small hill just south of Tusayan, about 3 miles from the entrance of Grand Canyon National Park, and another 5 miles to the Visitor Center on the South Rim. The airport is at 6677 ft MSL, while the Visitor Center is at an elevation of 6860 ft which makes for a great climb! Just north of the airport is a small shopping and services area, with some great places to eat and shop. The shortest route to the South Rim is riding the highway, US-180 S, sharing the road with the busy traffic. Some local folks suggested using the Greenway Trail. While slightly longer, it is a great alternative and a very scenic route. 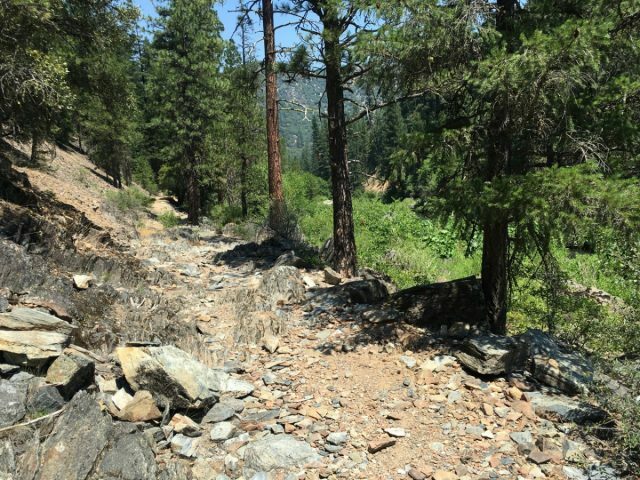 The trail is in great shape with gradual rise towards the rim. It has both gravel (60%) and paved sections and meanders through pine forest just west of the highway. After about 7 miles of trails, we ended up at the Visitor Center complex, of course as we were riding we had furry friends to see. At first I thought they were horses, due to their size, then realized they were some of the largest deer I’ve ever encountered. We stopped by and visited the hospitable folks at Bright Angel Bikes, a great place to rent bikes on the South Rim. They helped with some minor adjustments and I offered them the chance to ride my E-mountain bike. I think they were spoiled. With limited time, this trip, we decided to head west towards Hopi Point and Hermits Rest. It was a path with initial downhill ride , i.e. tough coming back, then moderately challenging 6 percent climbs. You share the road with shuttle buses, and it is somewhat narrow with no shoulder to speak of. You get very friendly with the shuttles since they can’t move into the opposing lane! The climb is well worth it. 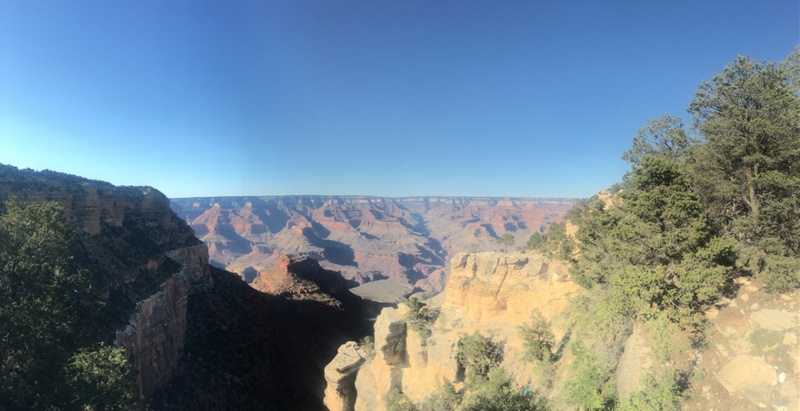 There are a number of scenic stops along the way, offering majestic views of the rim and canyon. We were riding with the setting sun, so the sun rays on the canyon wall were spectacular. On the South Rim, this is also the top terminus for the walking trail to the canyon bottom. 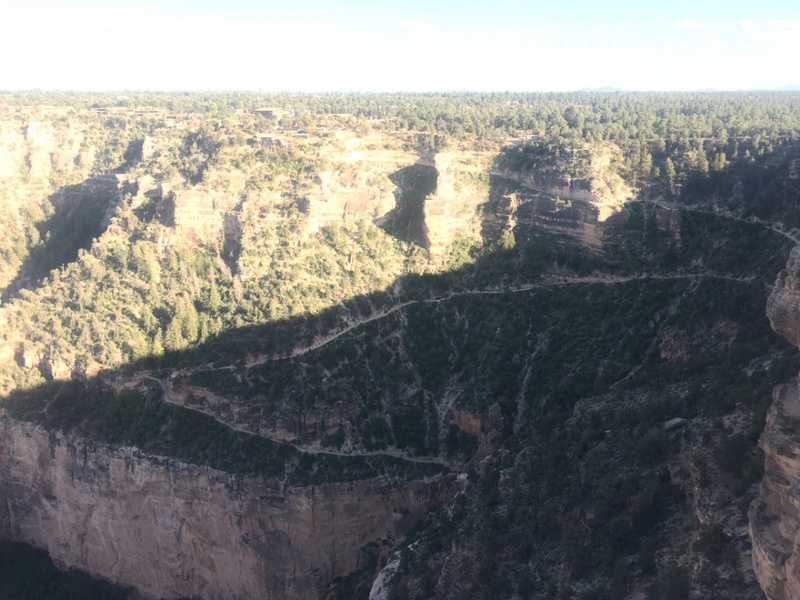 This photo shows one of the trails down into the canyon from the rim. Step back just one more step – for the photo! Just before reaching the last view point, we decided to call the FBO in case we didn’t make it back before they closed. It was an excellent idea, since we learned the entire airport was closing that night at 7pm due to all airports lights being inoperative. Our choices were to either change plans and stay the night somewhere, or speed back to the airport. We only had an hour to get back, load the bikes, and takeoff. Our calculations indicated we would barely make it in time. We raced down the rim, climbing up some of the great downhills runs. While I hadn’t used the electric assist much on the ride up, it came in handy also enabling me to push my biking colleague up some of the steepest hills. This time we returned along the highway, 64, which has only a one foot shoulder on a large portion of the road. Most of the motorists were gracious and tried to give us some room, and the truckers were professional. Only a few drivers were clueless how to share the roadway with cyclists. We arrived at the airport with 15 minutes to spare – now to preflight the plane, load the bikes and take off. The tower was scheduled to close at 7, but for some reason they shutdown 10 minutes early. Quickly taxing we were able to take off 3 minutes before closing — taking a photo in case the FAA challenged our departure time later ! We only biked 25 miles, a very small portion of the area on this trip. The flight back was a great way to finish the day – flying at night, through the clouds into Montgomery. The next time, I’ll plan a longer sojourn with a trip to explore the North Rim as well. 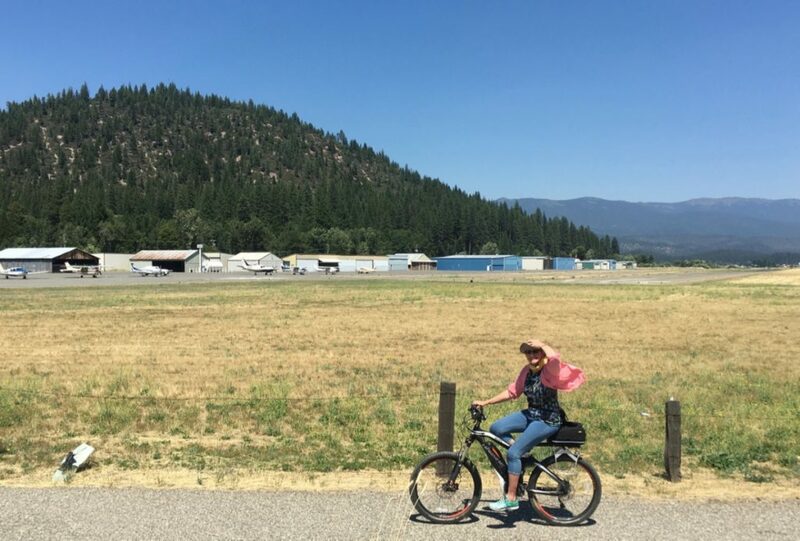 Bicycling offers such a wonderful way to explore our national treasures, combining it with my other love – flying, only makes it that much better!